Creating your own personalized Christmas cards is a thoughtful (and cost-efficient!) way to show the people in your life that you care about them. But I get it: if you’re not a graphic designer or DIY-guru, the idea of creating a bunch of Christmas cards from scratch might seem too big a task to take on. 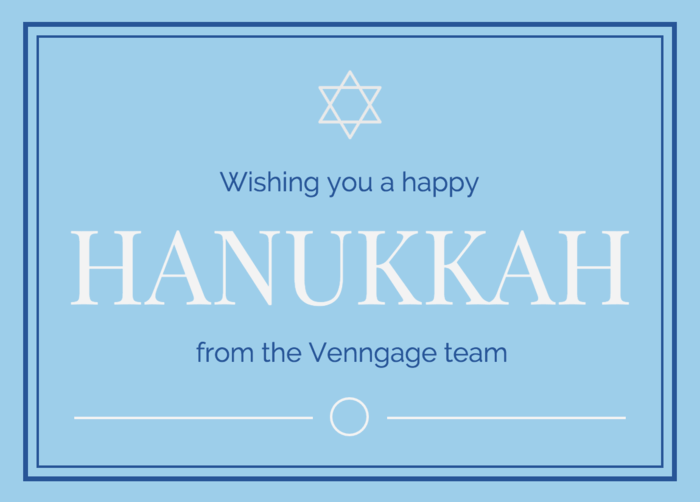 Don’t worry–Venngage’s card maker has got you covered. 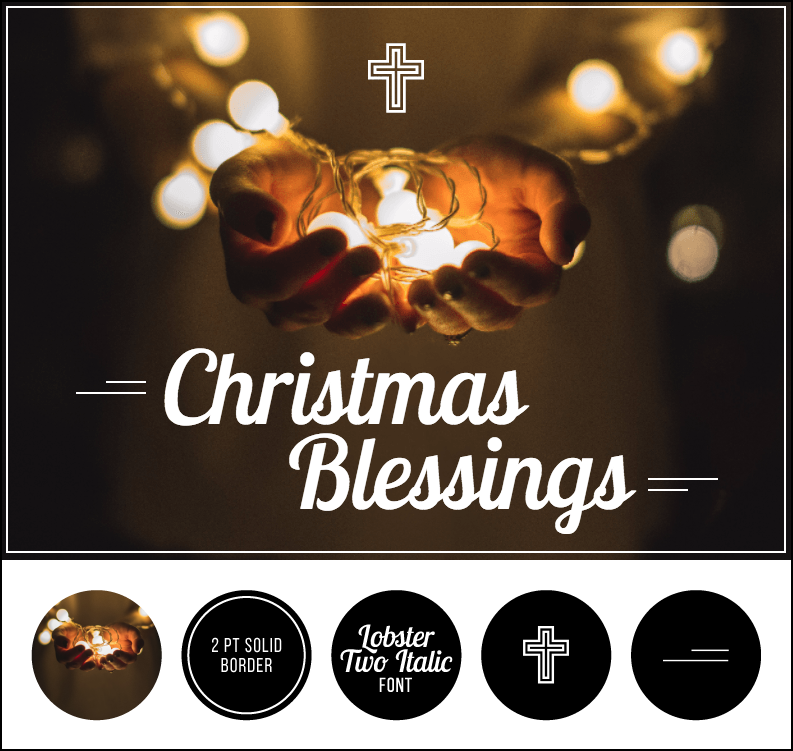 20+ Christmas card templates, Hanukkah templates, and other holiday templates! 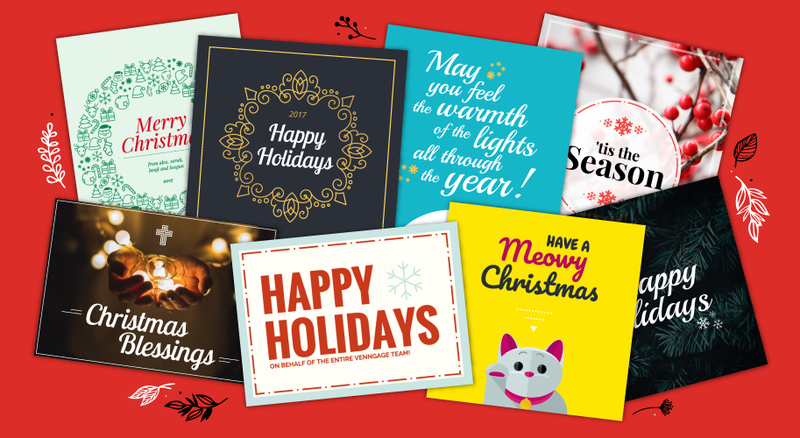 There are thousands upon thousands of fonts out there, so we picked a selection of holiday fonts that are perfect for Christmas cards, Hanukkah cards, and holiday cards in general. 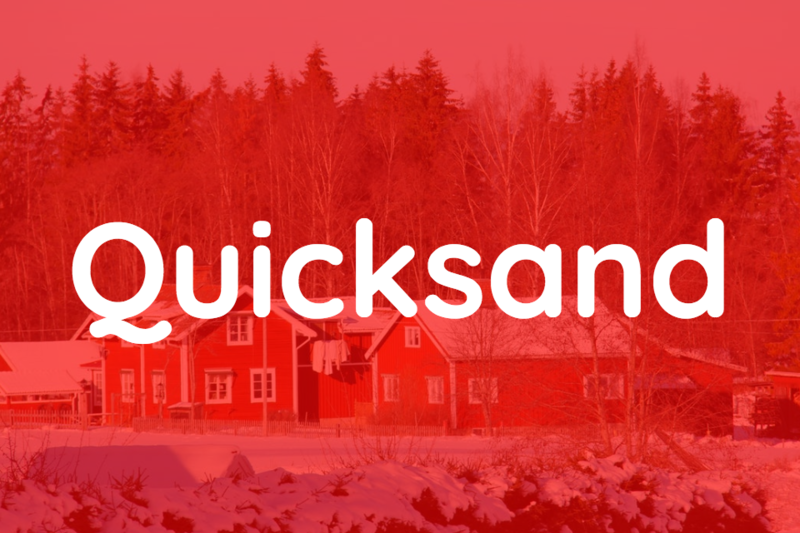 To make it easier to find the best font for your design, we’ve organized them into different font types: cursive fonts, cute fonts, and elegant fonts. When it comes to picking fonts, we recommend pairing two to three of these fonts together to create a beautiful, quirky, and creative card design. Do you want to give your holiday cards a heartfelt, handwritten feel? 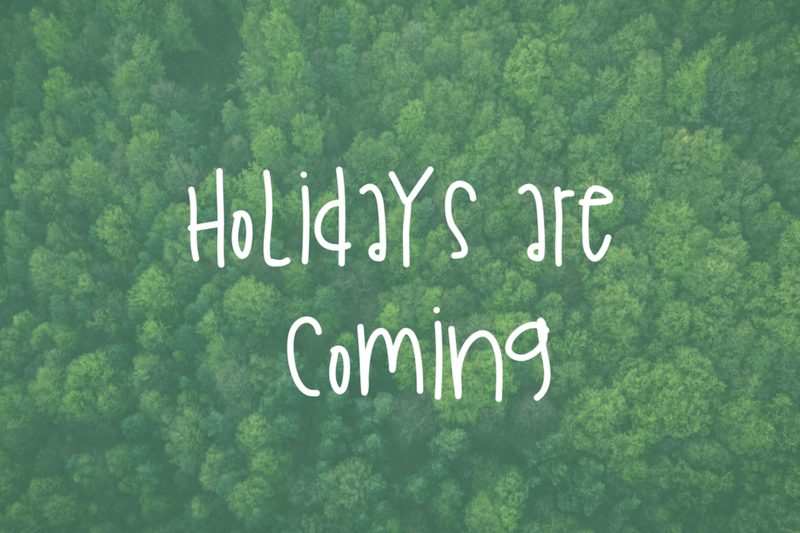 A cursive font is a classic for holiday cards. 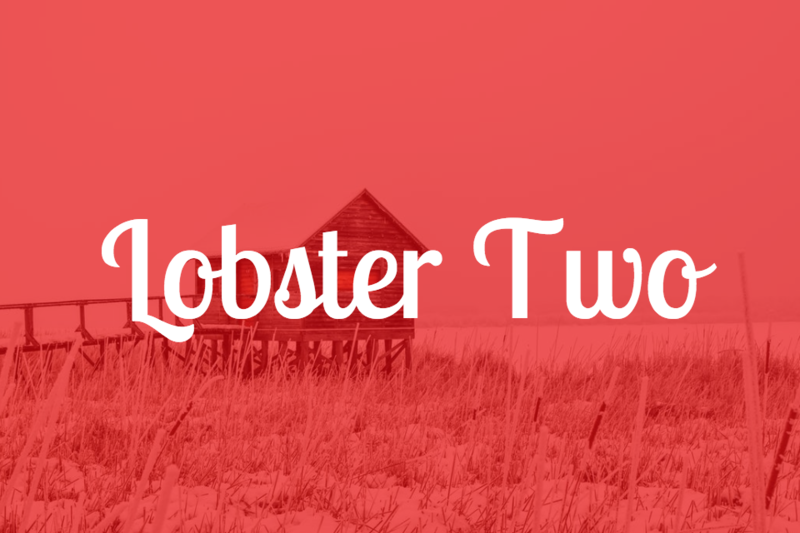 Lobster Two is fancy without being gaudy. In fact, it looks like it came right off the pages of a storybook. With embellishments that look like the skids on a sleigh, this font is perfect for Christmas cards. Yellowtail takes it’s design cues from classic painters of the 1930’s. You can clearly see that influence in the way that the letters flow together so well. 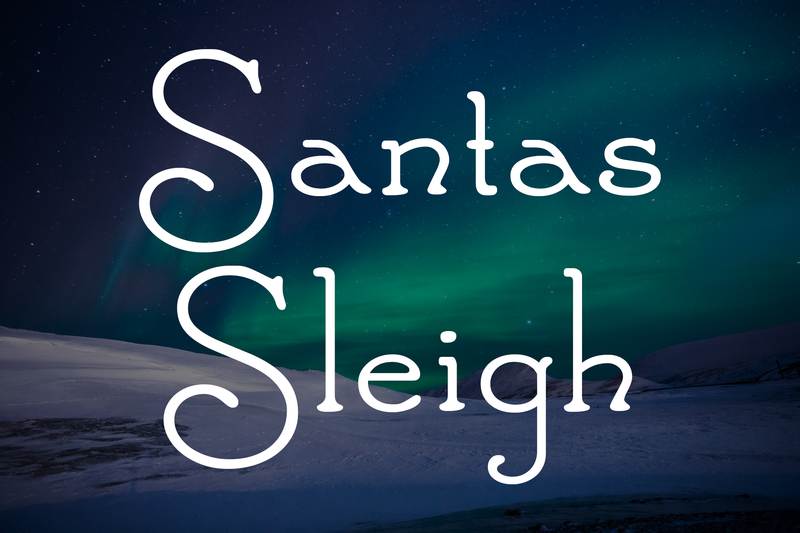 Use this font to bring some of those classic Christmas feelings back to the holiday season. 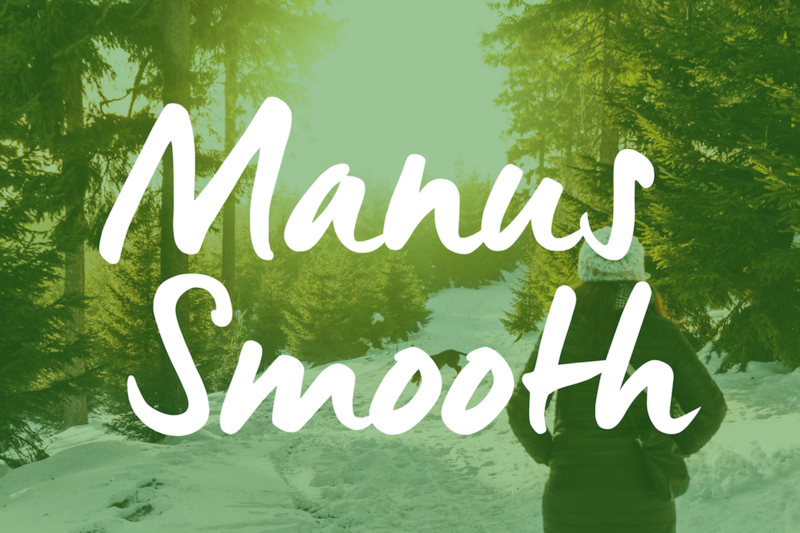 Manus Smooth is an awesome display font that works for almost any card design. It mixes the best parts of handwritten and calligraphy fonts that we have seen above to create something new. The smooth flow of this font makes it perfect for scrawling out messages. 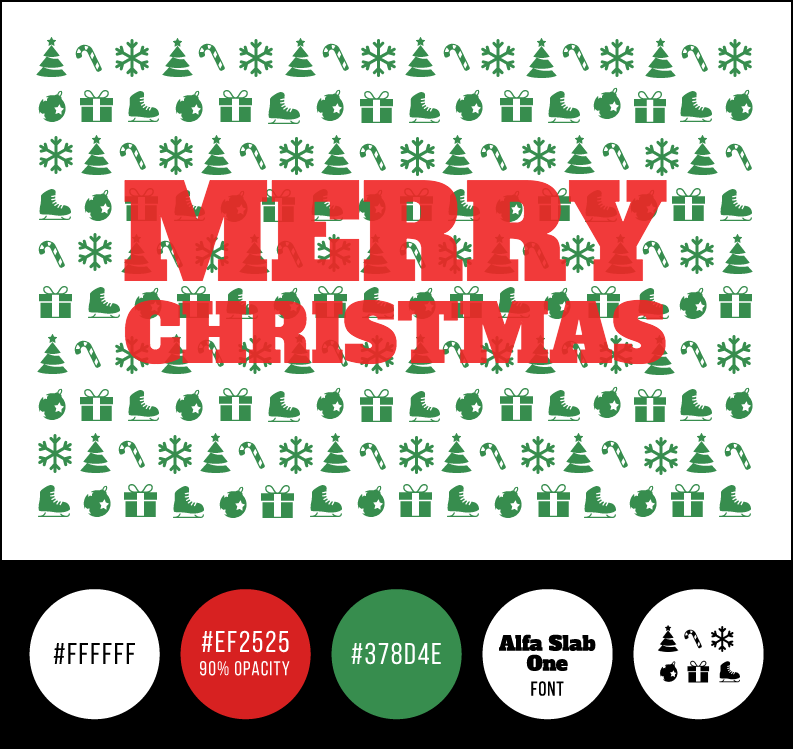 Merry Christmas may be the perfect Christmas card font–after all, it’s in the name. This font is reminiscent of old Christmas specials on TV. People young and old will be able to relate to this nostalgic font. 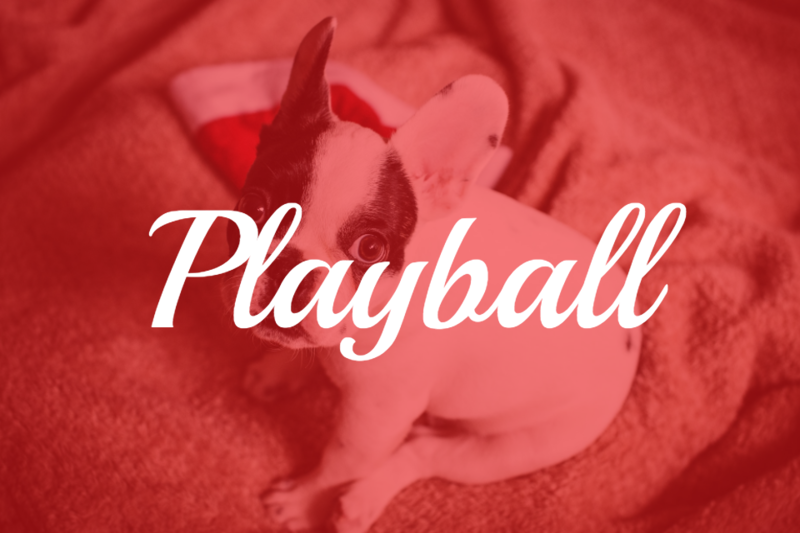 Playball is a font that was specifically designed for festive events, like Christmas or the holidays. 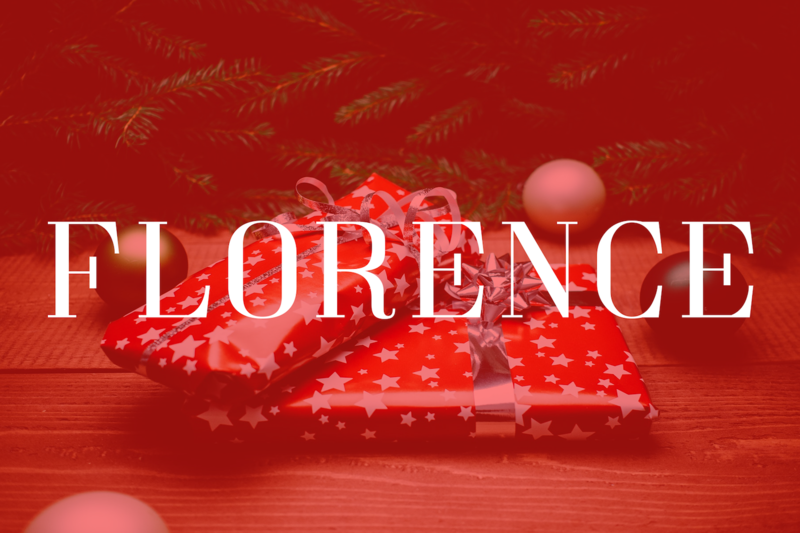 This means this flowy font will look right at home on your holiday card. 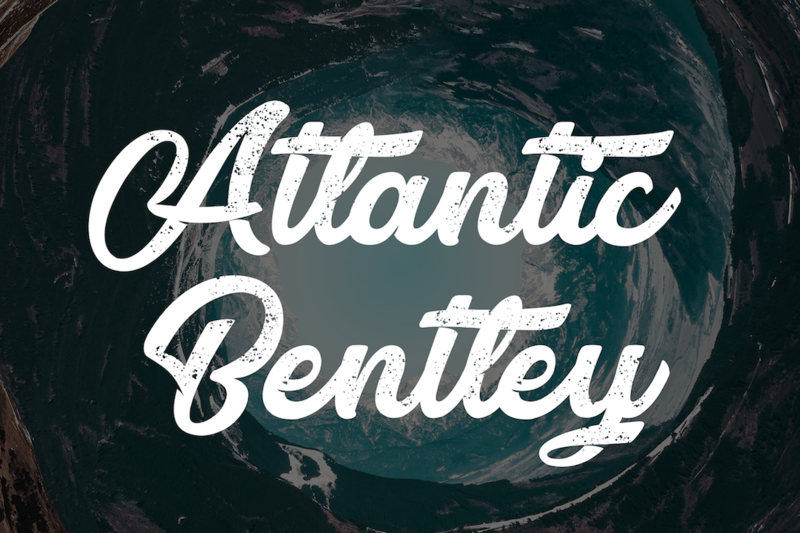 If you want to create a Christmas card with a cool experimental look, then Atlantic Bentley is a great choice. This font feels like it was pristinely created back in the day and time has worn it down to what you see now. Use a dark palette with this font or a darker photo like in the example above. That way, the font and all its imperfections will really pop when your friends open it. 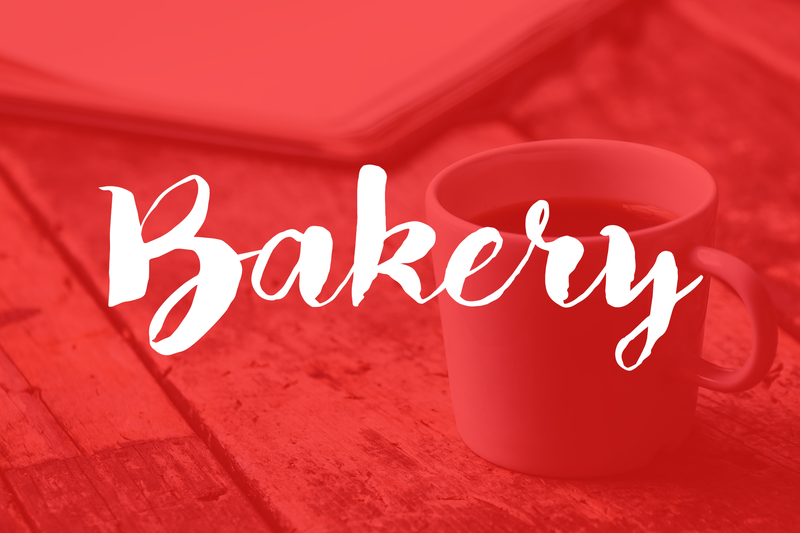 The Bakery font was probably ripped straight off the menu board of a French cafe. The combination of thick and thin strokes make it feel like a person wrote this font in a hurry before the store opened. 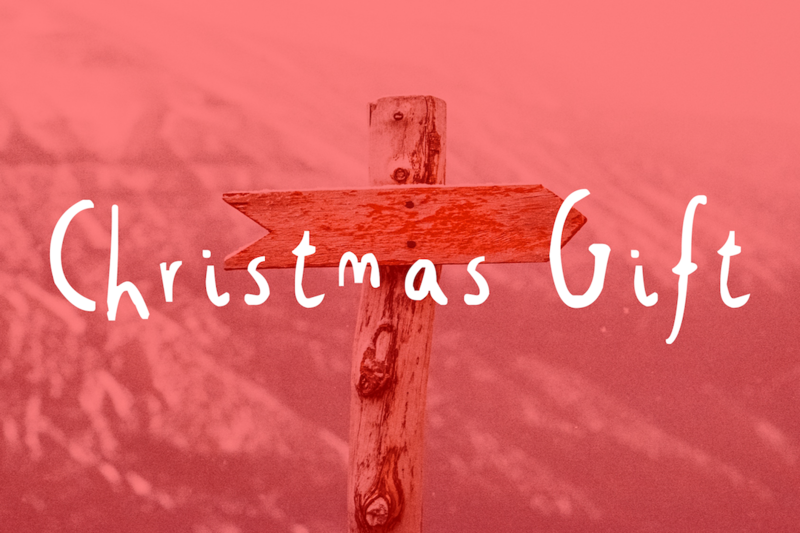 The artful imperfections of this font will make your Christmas card feel a lot more genuine. Bring a modern feel with classes touches to your Christmas cards with this beautiful font, Beautiful Holiday. 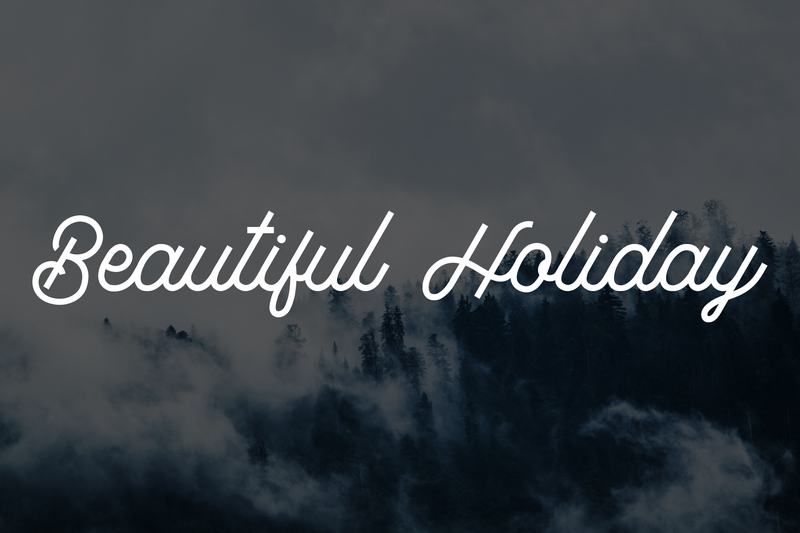 The cursive typeface with long, thin strokes makes this an ideal holiday font for your cards. 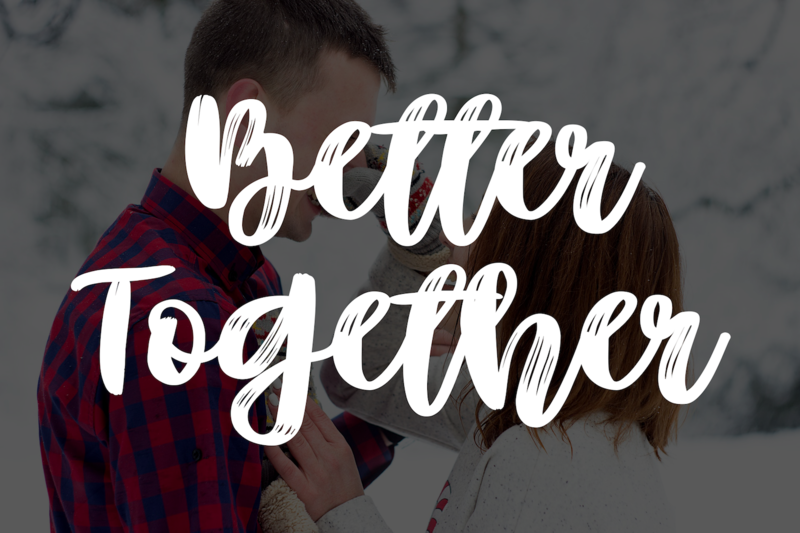 Better Together is a display font that it perfect for big, short phrases on your card. 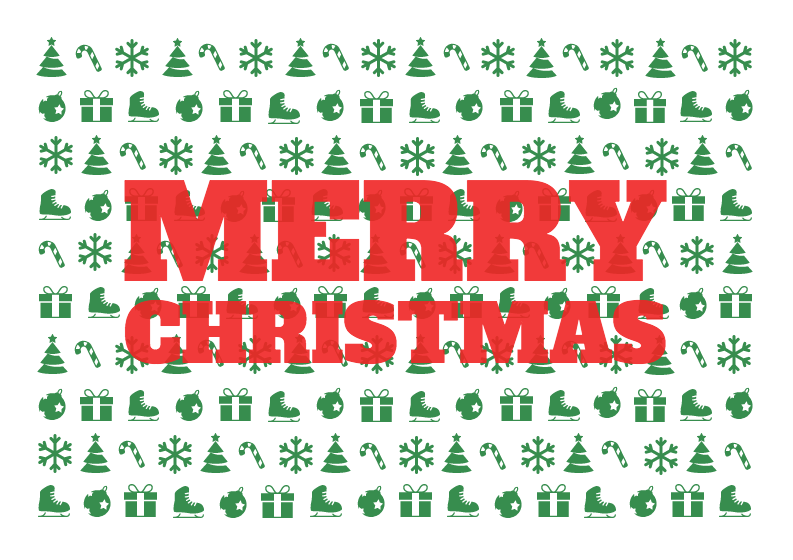 Phrases like “Merry Christmas” or “Happy Holidays” will look awesome in this font. Pair this with a more minimal body font, like Light Font. 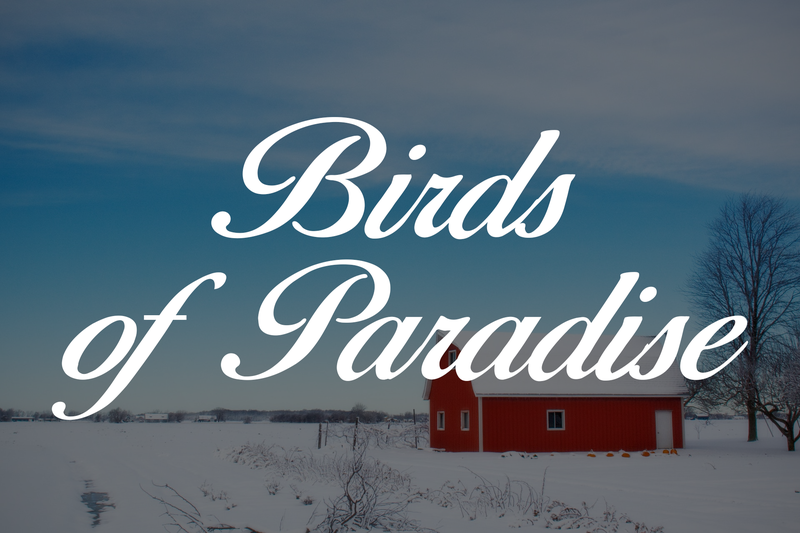 Birds of Paradise is a versatile font that can be used for all sorts of holiday cards. The perfect mix of calligraphy and script features, this font is nice and easy to read. It can be used to wish someone a happy greeting on the front cover, or be used as the main body font for your card’s message. If you want your Christmas card to look like it was written by the big guy in red himself then use Christmas Day. I can imagine him sitting down at the North Pole writing this font himself. Just remember that this is a display font and can sometimes be a little hard to read, so don’t use only this font. One of the best parts of this font is how well the cursive letters are created and spaced. 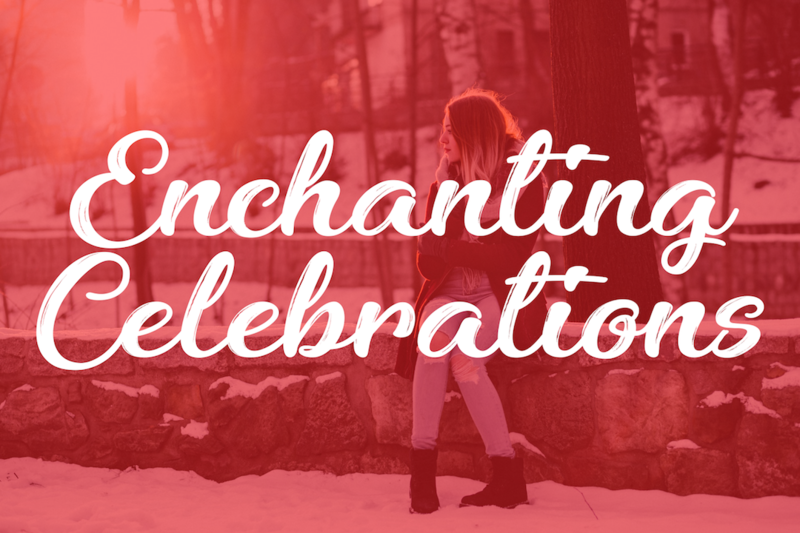 Enchanting Celebrations is another script font that is super decorative but also easy to read. 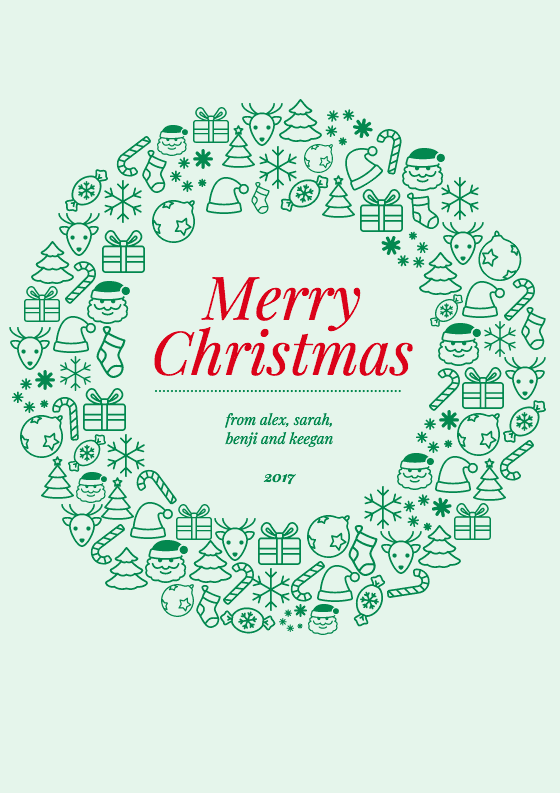 It can be used in combination with a sans serif font like Cocogoose to upgrade your holiday card cover. 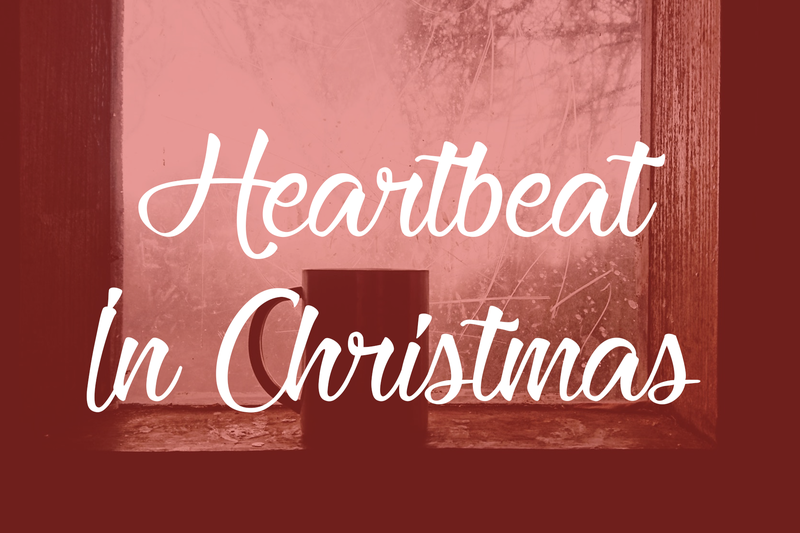 Heartbeat in Christmas is a font that would look interesting on anyone’s Christmas card. After all, Christmas is in the name! This heartfelt font feels comforting and familiar. 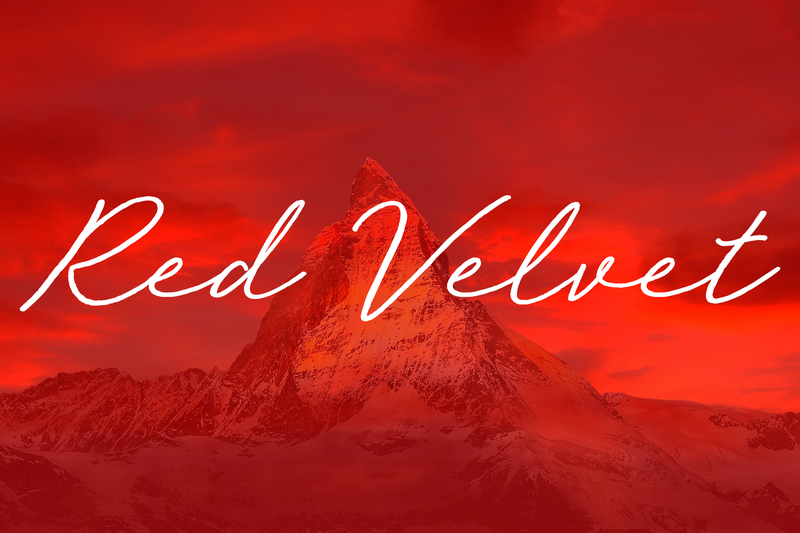 Shamelessly romantic, Red Velvet is a font that looks like it was scrawled out by a lover. Have someone you want to give your heart to this Christmas? This is the font to write your love letter with. Tired of trying to decide which font to pick for your Christmas cards? Phuket! Vacations in Phuket might just be the best named for a font on this list. This font is snazzy and opulent, like spending Christmas at an all-inclusive resort. 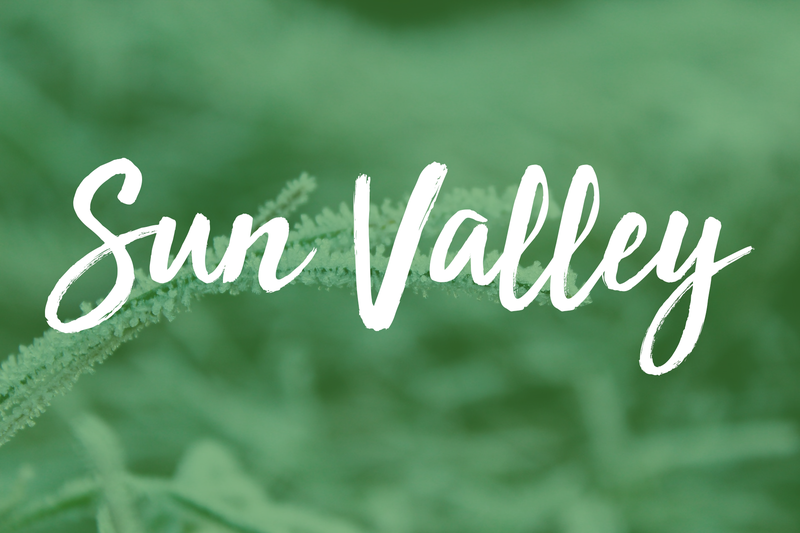 The loose brushstrokes aesthetic of Sun Valley makes this font perfect for a creative, crafty Christmas card. 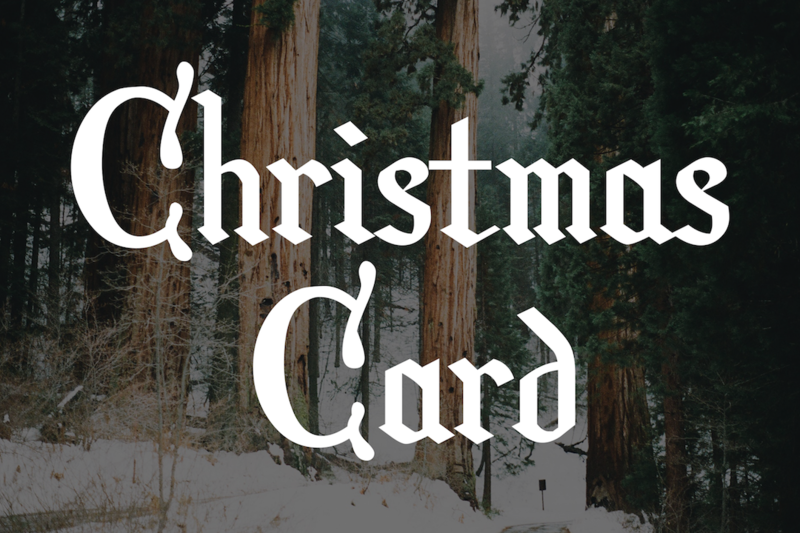 Pair this font with a woodsy background image for a card design that Bon Iver wouldn’t be able to scoff at. Do you want your holiday cards to feel cheery and fun? Try one of these unique fonts. 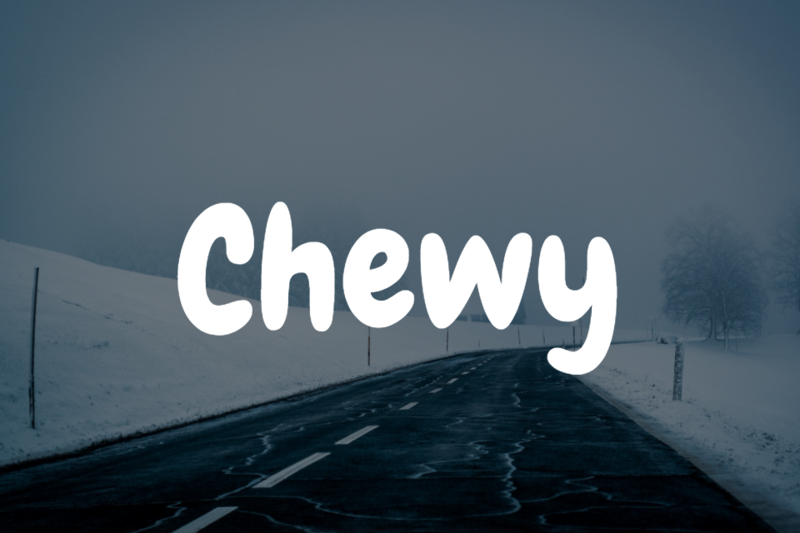 Cute and round like a snowman, Chewy is a font that brings a feeling of childish fun to your Christmas cards. Write a big, cheerful message on your card in this font, to give people warm fuzzy feelings when they open it! 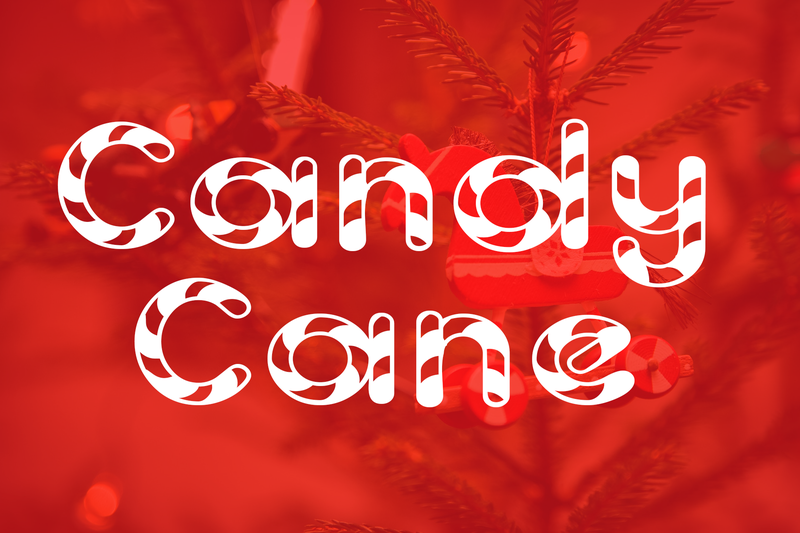 One of the most ubiquitous holiday candies makes an appearance in font form with Candy Cane. Like other decorative fonts, this one is ideal for big, short phrases. Pair it with a more readable body font to create a pro Christmas card! 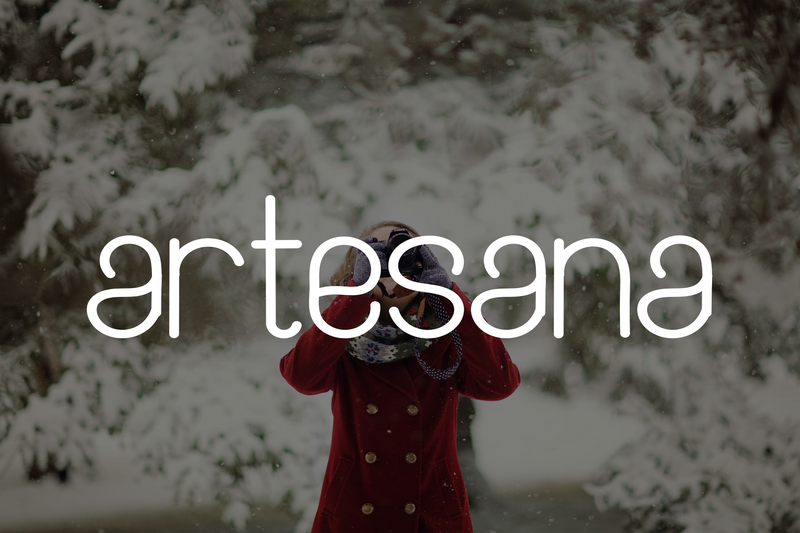 Artesana is a lowercase font that you can use to add a familiar or casual feeling to your Christmas cards. The uniquely designed letters give this font a one-of-a-kind feel. Pair Artesana with a bold font like Paytone One (available on Venngage) for a quirky and interesting holiday card. 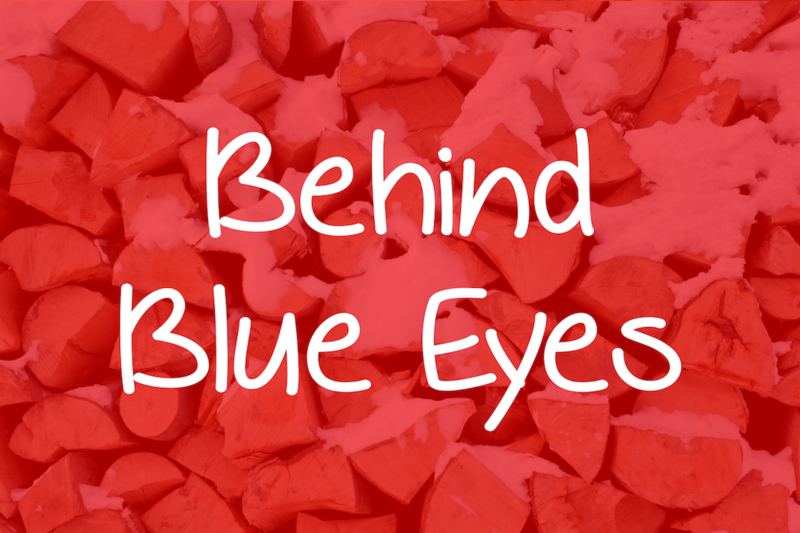 Behind Blue Eyes was created to look like someone was writing with a felt tipped pen, and it makes for an authentic look. It will almost look like you wrote out your messages by hand–though your card will be no less heartfelt! 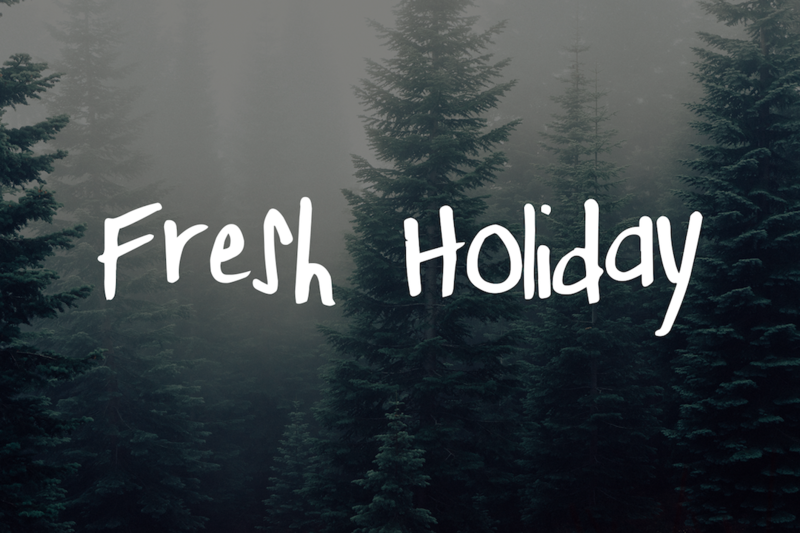 Fresh Holiday is another font that looks like it was handwritten. You can give your cards a more personal touch with a casual scrawl like this. Don’t forget to sign your name! 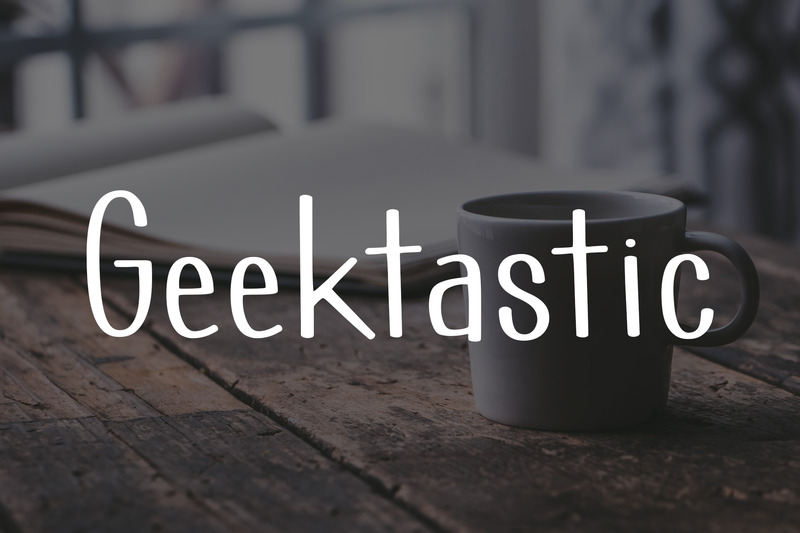 Let your inner quirkiness shine through this holiday season by picking Geektastic. This font feels goofy and fun, without being too in your face. 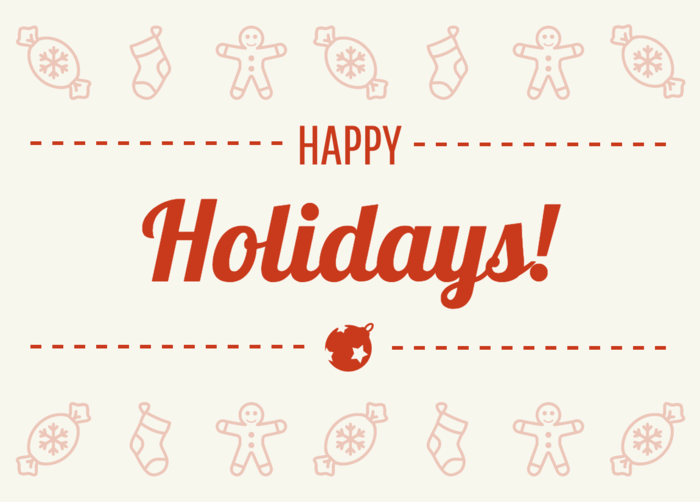 In fact, tech companies or startups would benefit from using this font on their holiday greeting cards. Christmas Gift seems to be inspired by someone writing all the name tags on the presents the night before. The lack of uniformity in each of the letters feels like it was written by a tired parent. This font is great for giving your card an authentic look. 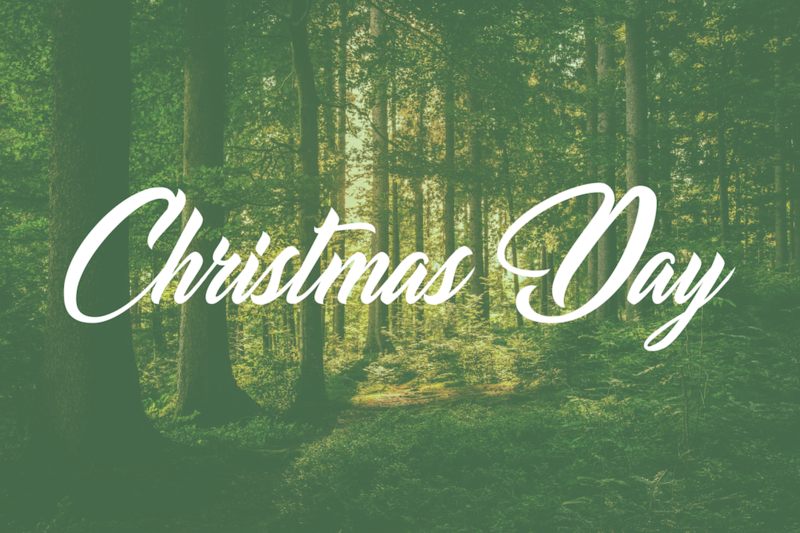 This is one of my favorite Christmas fonts, by far. It looks like Christmas Jumper was pulled straight from a sweater knit by grandma. 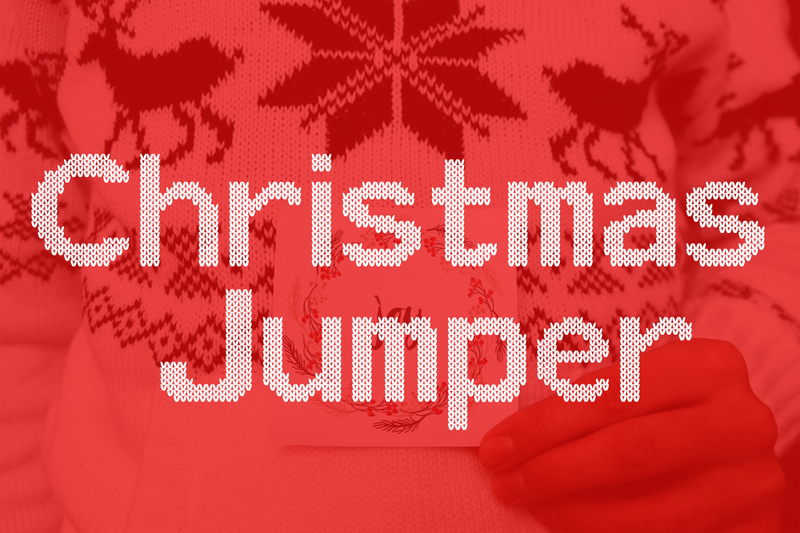 We recommend using this on a very minimalistic Christmas card to make it look like a real sweater. 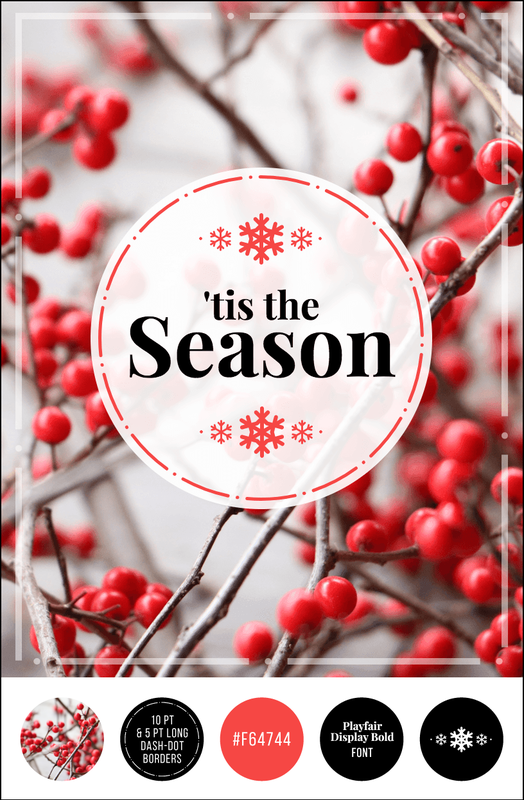 Although Christmas Season is a very thin font, it still makes an impact on your Christmas card design. This font has a casual and comfortable feel, and can easily be used on a family card or even a corporate Christmas card because of that. Add a little bit of authenticity and quirkiness to your Christmas card with Holidays Are Coming. 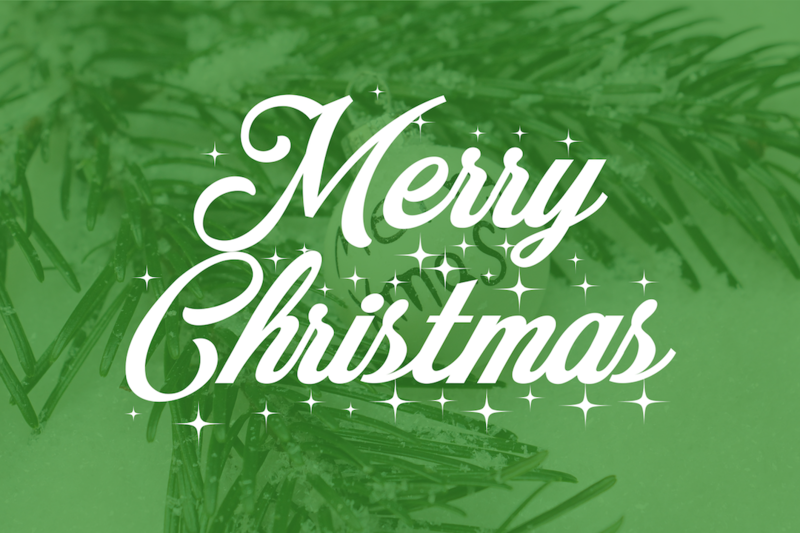 This font has a DIY feel that will make your Christmas card design friendly and inviting. 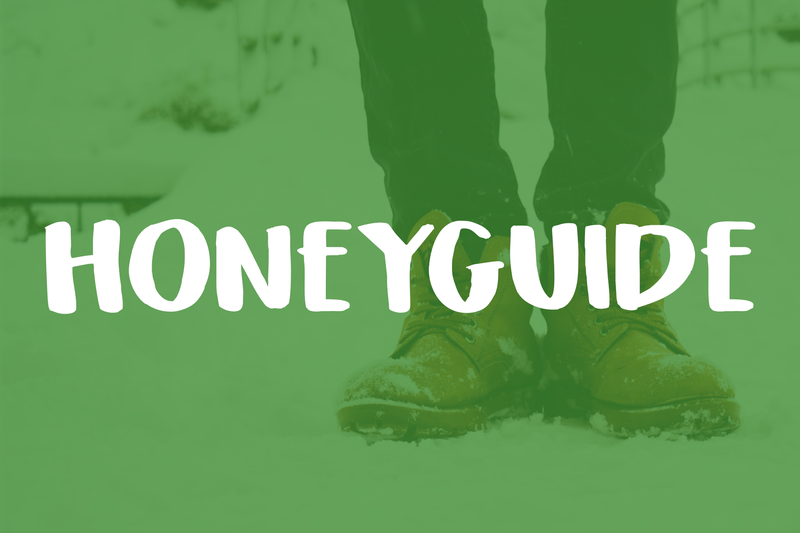 If you were to create a font using only a massive permanent marker, you would have Honeyguide. That’s what makes this font so fun and perfect for a made-from-scratch holiday card. It honestly looks like someone just decided to write you a nice note for the holidays. 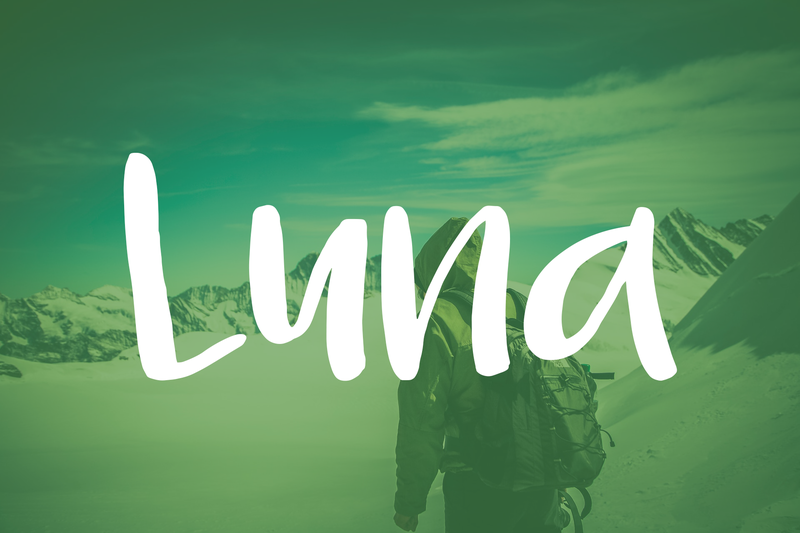 Out of all the handwritten fonts in this collection, Luna might be the most sincere looking. 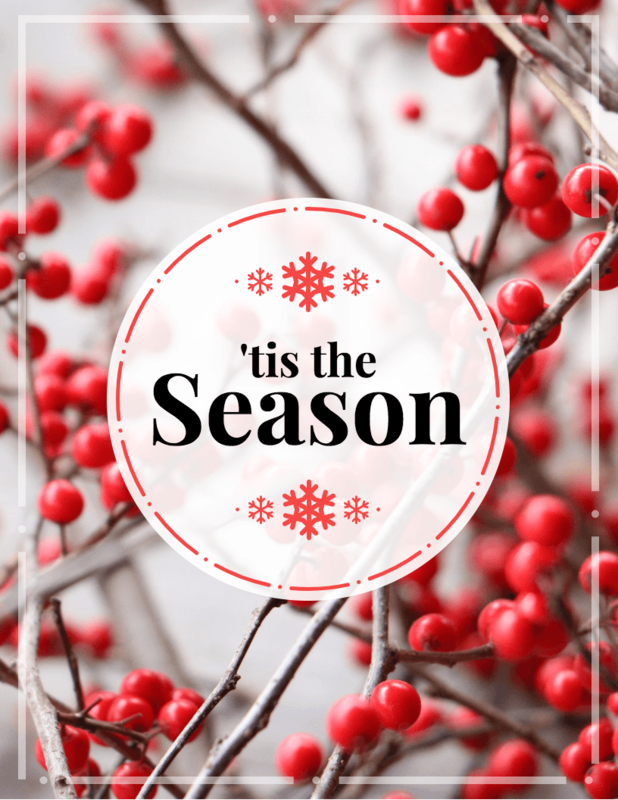 Use this wholesome font for the title text to create a warm and homey holiday card design. 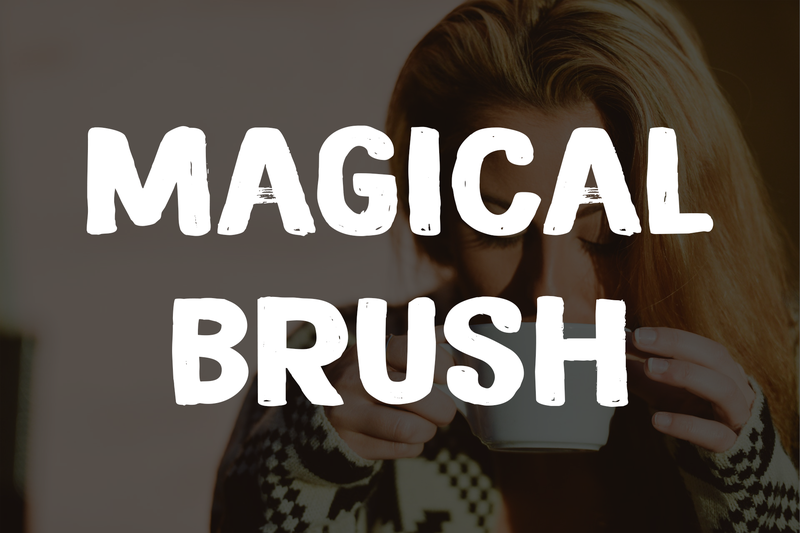 Magical Brush uses, well, a paintbrush as its main inspiration for the font. 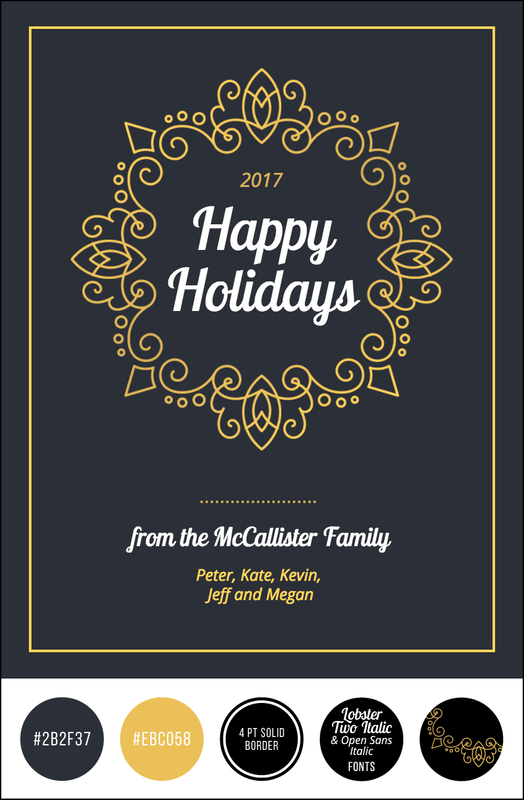 Use this font with a nice family photo and you will have a breathtaking holiday card in no time. Quicksand was designed using geometric shapes as the main inspiration. Because of that, it has a childlike feeling that makes it perfect for family holiday cards. 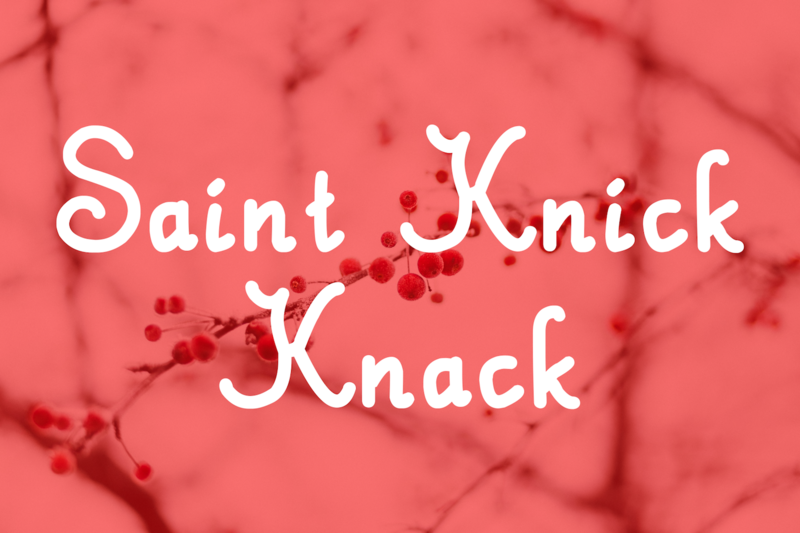 Saint Knick Knack looks like the writing you would put on a tag for a homemade box of holiday treats. The playful swirls and loops give this font a fun and carefree feeling. Perfect for a homemade Christmas card! Santa’s Sleigh will make you think of jingling bells and having trouble falling asleep on Christmas eve. This font has a classic feel that will take your Christmas card recipients back to their childhood. 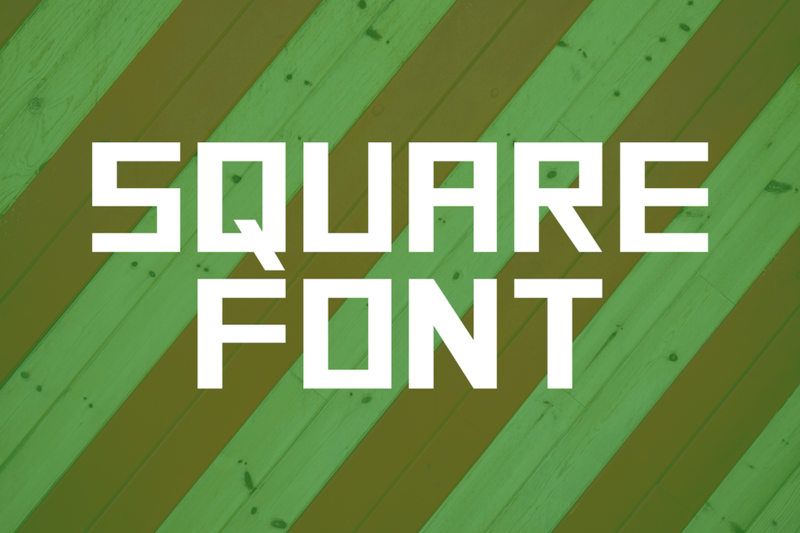 SquareFont is a very bold geometric font. 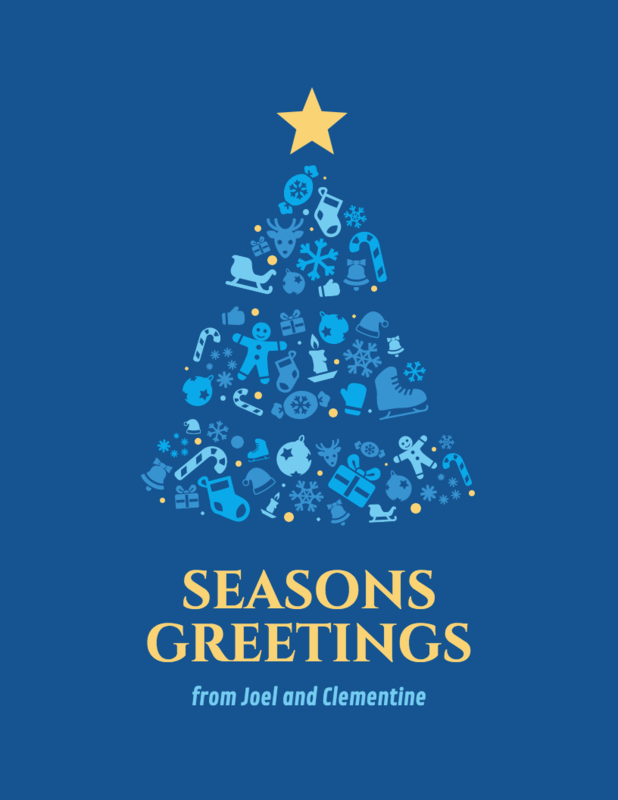 This font can be used to make a holiday card that has a modern or industrious theme. Got someone in your life who loves woodworking? Mechanical work? This is a font that will speak to them. 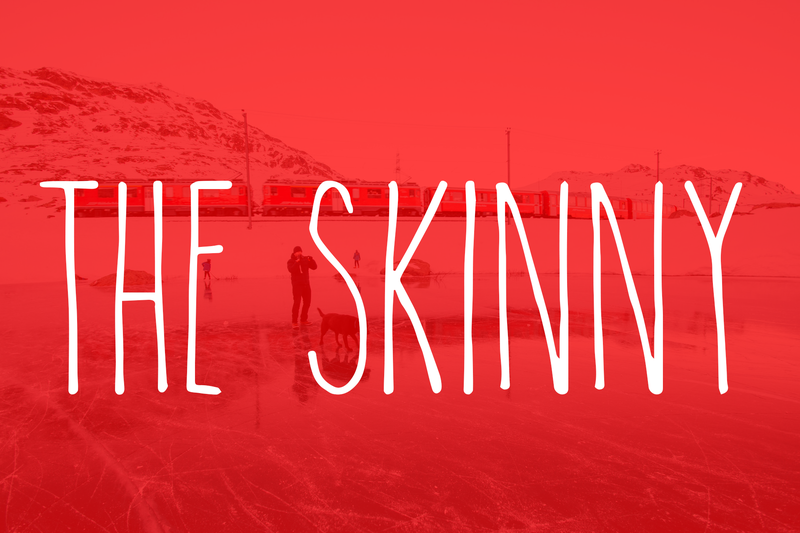 The Skinny is a simple font that you can use to bring a minimalistic feel to any Christmas card. 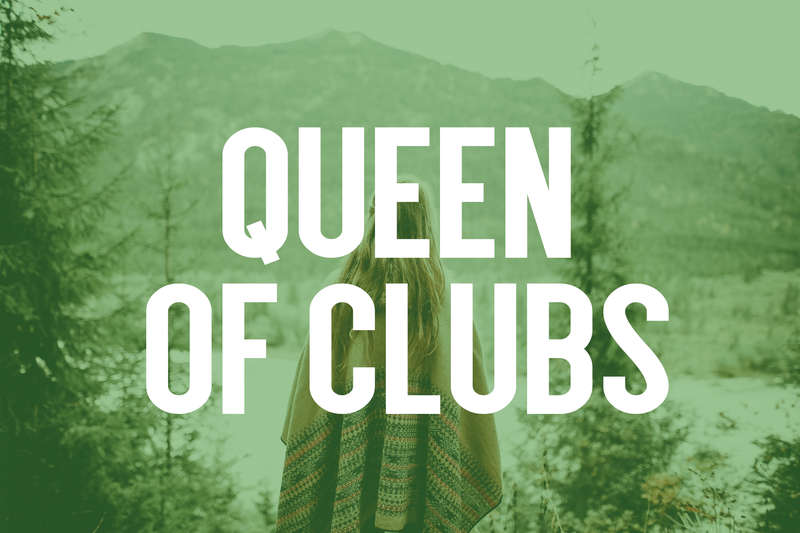 Pair it with a bolder font like Queen of Clubs to complete the minimalist holiday card you have always wanted. 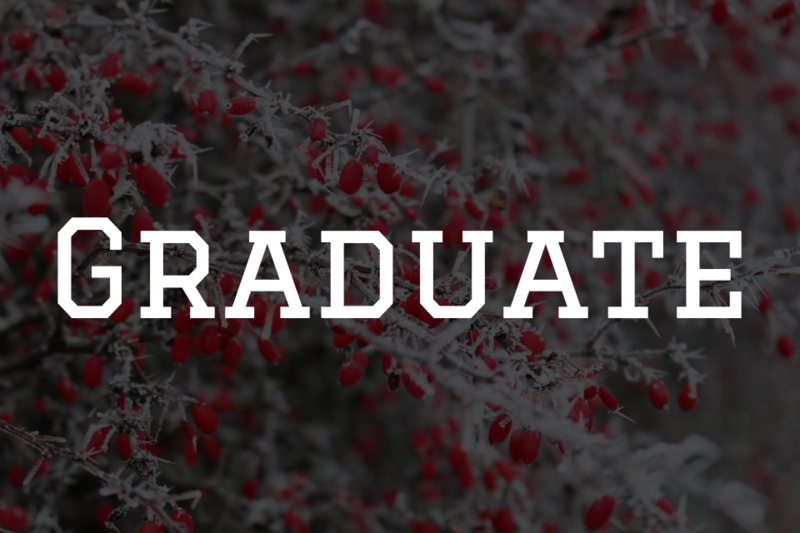 Graduate is an ideal font for schools or universities who want to send out holiday greeting cards. It’s an old-school font that almost anyone will recognize and associate with their alma mater. For a classy design, try one of these elegant fonts. After all, the holidays are a time to glam it up. Bring a touch of class to your Christmas cards. 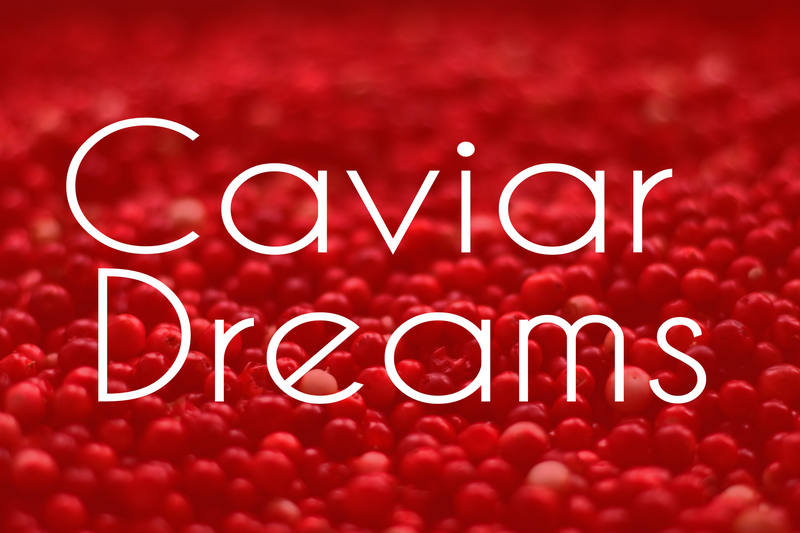 We have been looking at a lot of title fonts so far but Caviar Dreams is an example of a font that can be used for both title and body text. 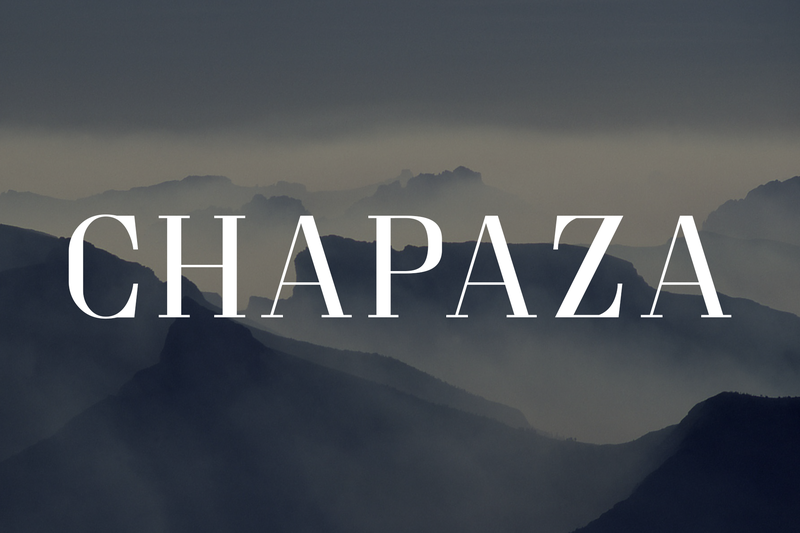 Chapaza looks like it should be on the front page of a newspaper or fashion magazine. The mix of light and heavy strokes make this font look timeless. Use it to bring a bit of sophistication to your Christmas card this year. Many of us have seen Christmas Card on our parent’s old holiday decorations. It looks like it came from a different era and can be very nostalgic if you use it in your Christmas card design. 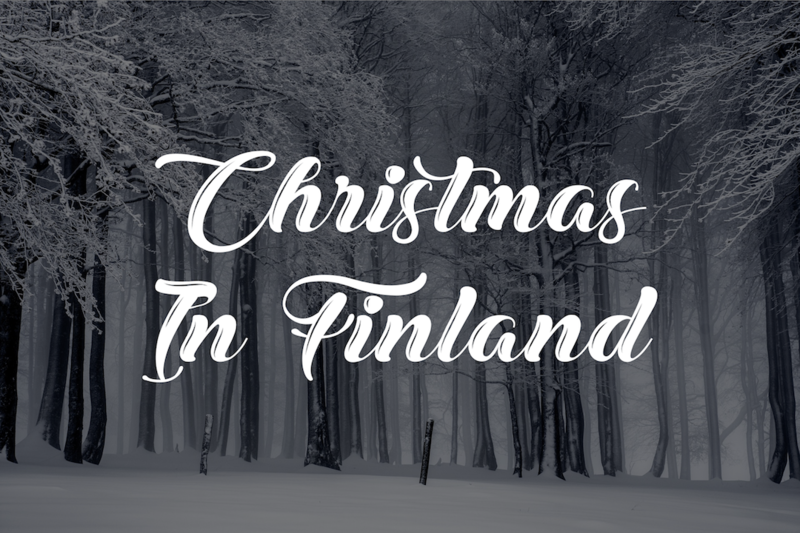 The Nordic countries are probably pretty used to having a white Christmas, and Christmas In Finland fits that imagery. 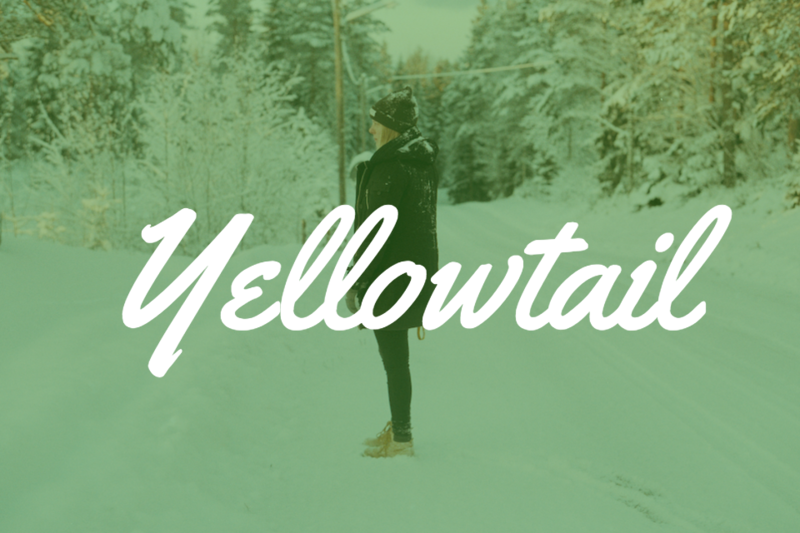 This whimsical font will transport you to a land of warm sweaters and fairytales. 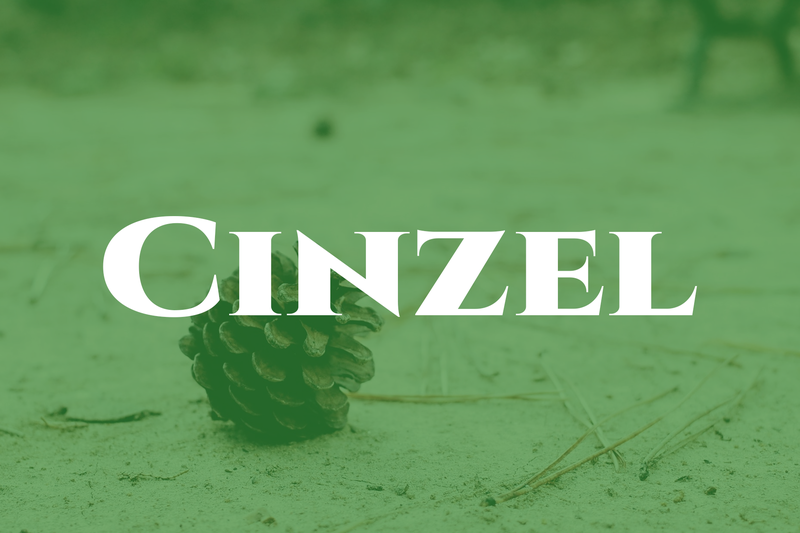 The sharp edges and thick lines give Cinzel a modern and eye-catching look. If you want to design a Christmas card that strays away from classic tropes, this is the font to do that. 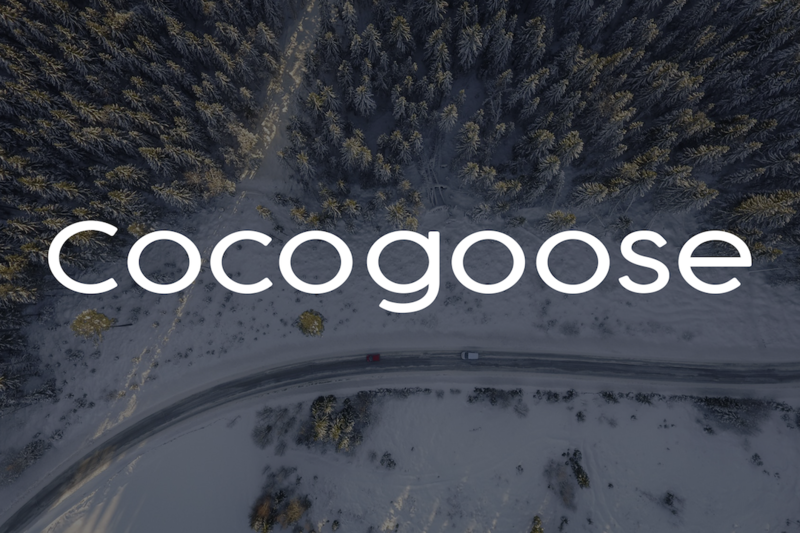 It’s got a weird name and it’s here to stay: Cocogoose. It’s a great modern font that can be used for both body text or titles. Match this with a heavy display font like Atlantic Beauty or Better Together and you will have a solid Christmas card. 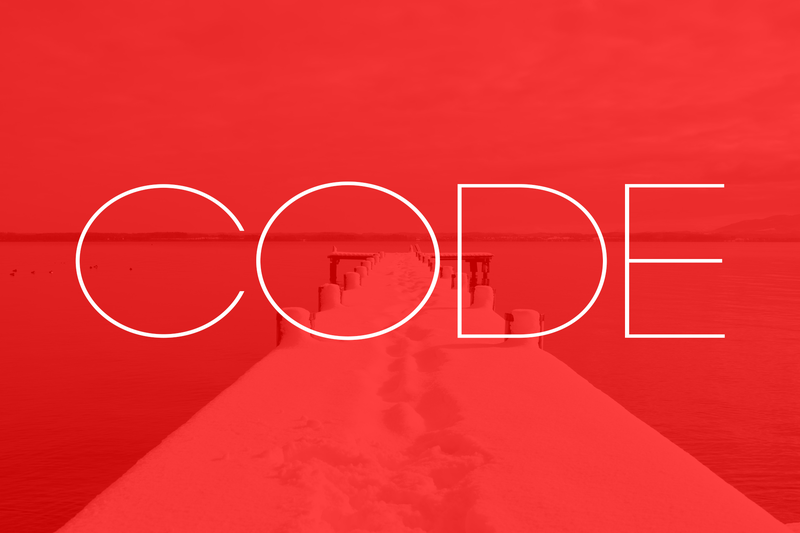 Code is one of those fonts that will still look ahead of it’s time in twenty years. It’s ultra modern, stylish and sleek. The thing lines also don’t obscure any background image you might want to use, so it’s perfect for a Christmas card with a nice photo or pattern design. 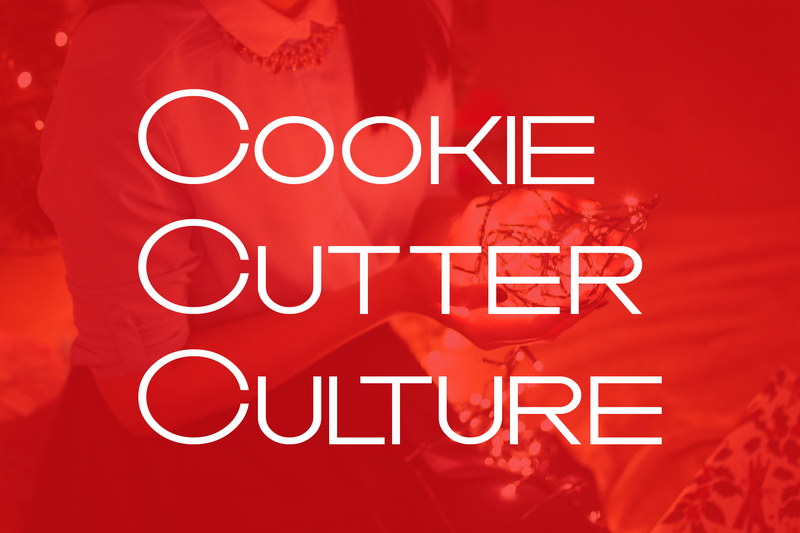 Take a look at Cookie Cutter Culture if you want a unique but geometric inspired font on your card. The letters feel familiar but also completely fresh at the same time—the O’s and C’s look like round cookies! 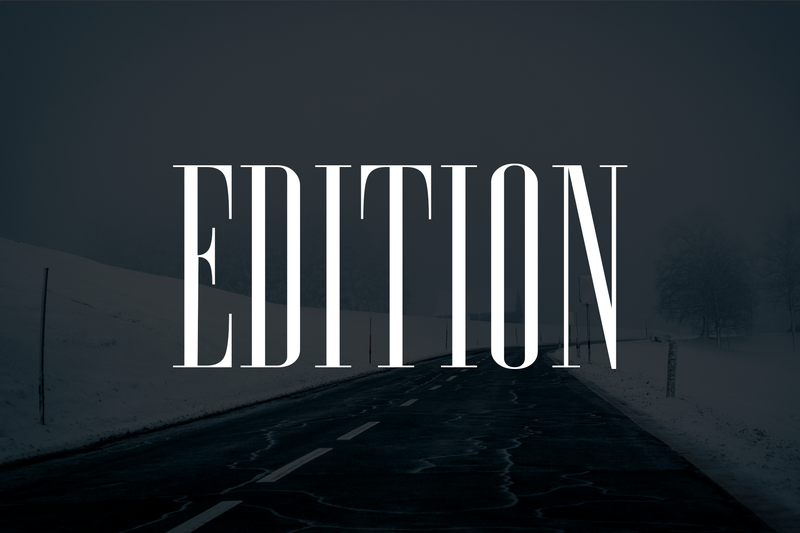 Edition is a beautiful font that harks back to a forgotten era where newspapers ruled the world of print. This font would fit nicely in a newspaper, book or magazine, but it will also give your Christmas cards a dramatic look. 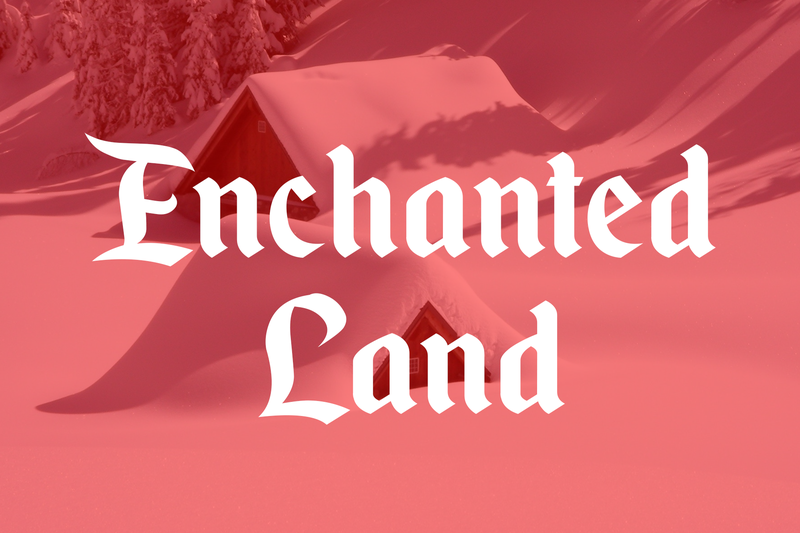 I know there are a lot of Disney lovers out there and Enchanted Lands is designed for them. Doesn’t it look like it was just pulled off the cover of a book of fairytales? Give your Christmas cards a magical feel with this beautiful font. With uniform spacing, interesting letters and bold strokes, Florence is a special monospaced display font. Not only does it use serifs on each letter, there are little extras on each you won’t find on another font. 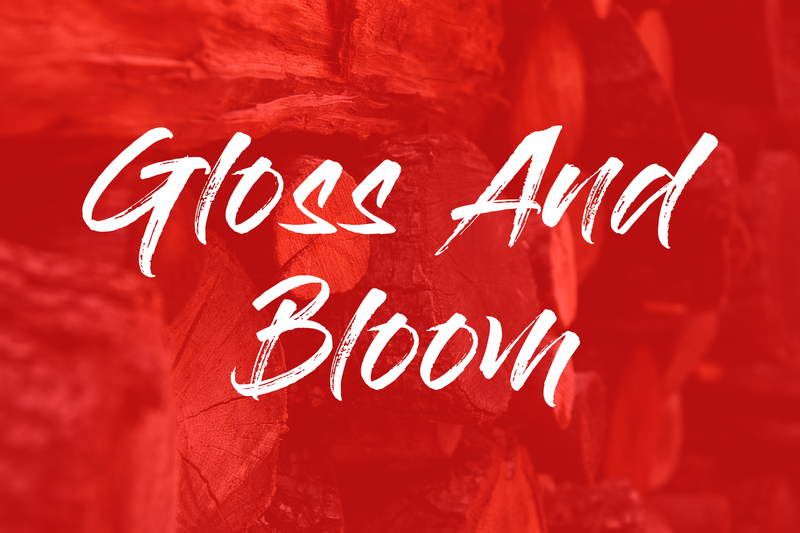 Gloss And Bloom is FIERCE, and I think that’s all you need to know about this font. It’s perfect for those chic Christmas dispatches you have always wanted to send. 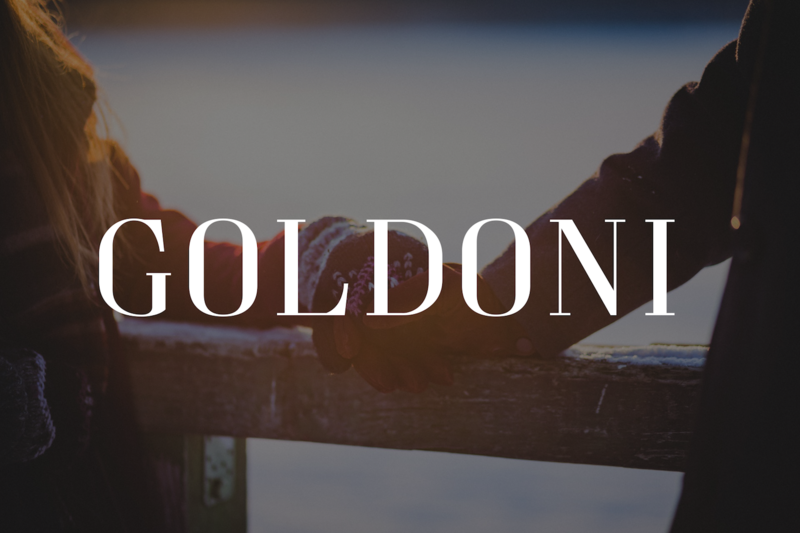 The mix of heavy vertical lines and slim horizontal lines makes Goldoni look crisp and sleek–especially the O’s! Plus, it uses the negative space to make the letters really pop from your Christmas card. 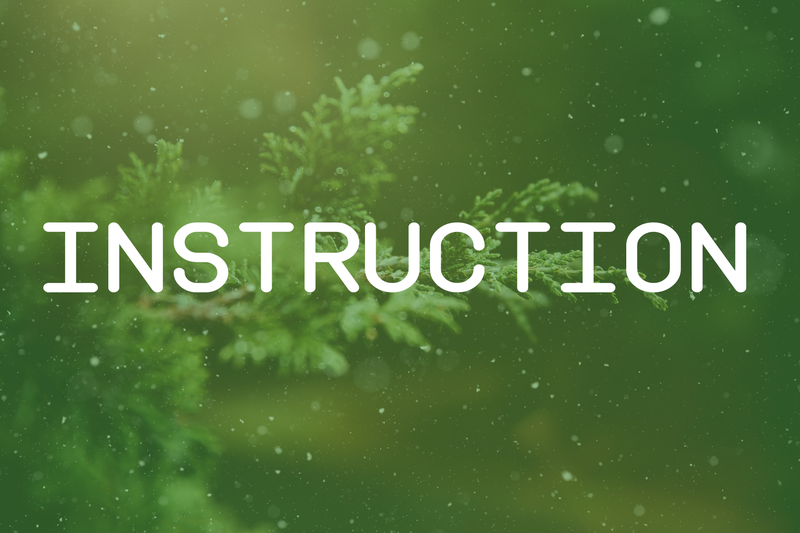 Instruction is a classic monospaced font that is perfect for writing longer messages in your Christmas cards. Got a heartfelt message you want to get off your chest? This is the font for that. 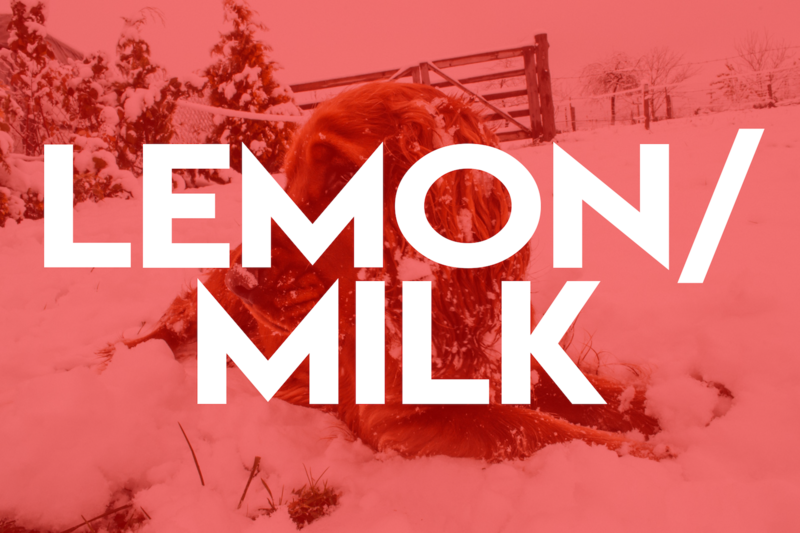 Lemon/Milk is one of those fonts that you will never forget after you see it for the first time. Match this big, bold font with a thin font like Code or Cocogoose for a modern and easy to read card design. 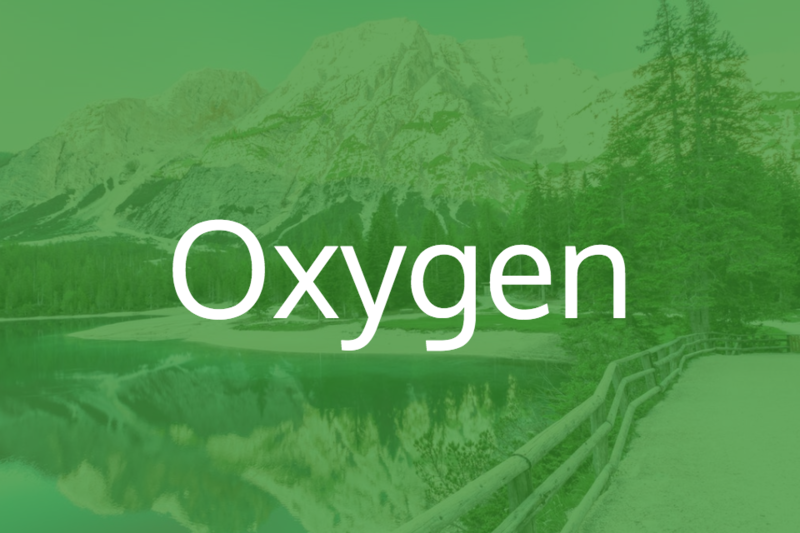 Oxygen is a tried and true font that is good for designs all year round. 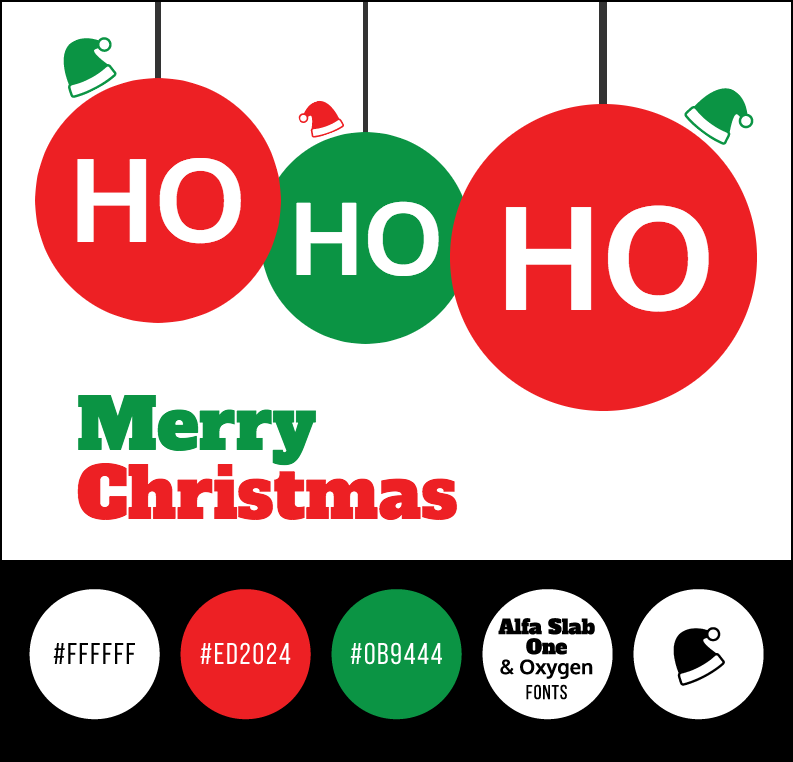 If you want to make sure your Christmas cards are easy to read (especially if you’re sending them out digitally), then Oxygen is a safe bet. 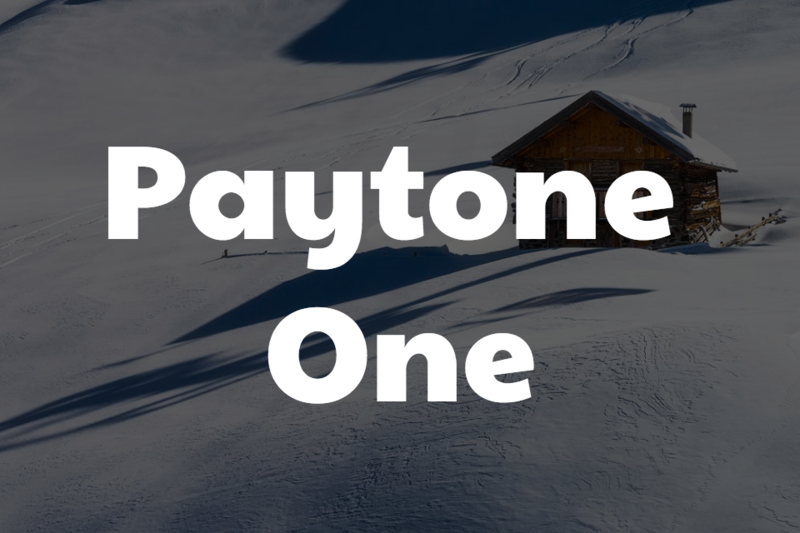 Although Paytone One isn’t the most exciting font in the world, it can be paired with more decorative fonts to make them pop. For example, combine it with Fresh Holiday or Geektastic for a nice looking holiday card cover. 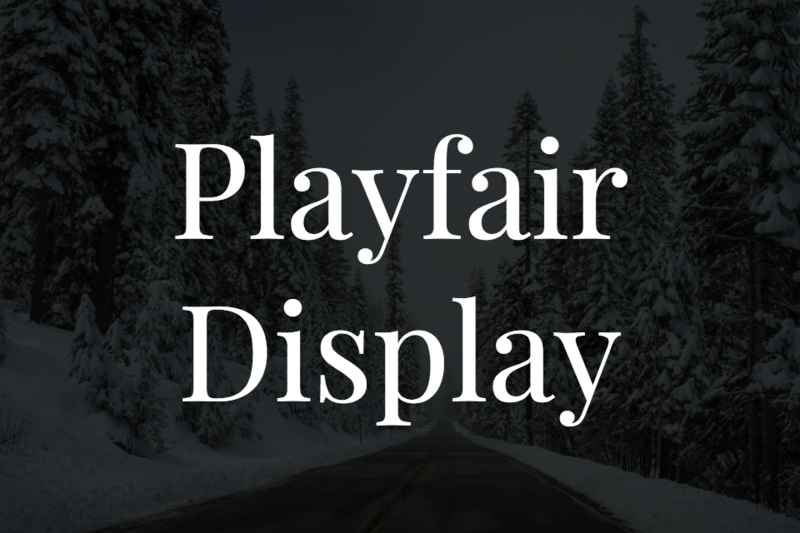 Playfair Display was designed to feel like it came from the past, and that’s why it has a classic feel. Draw eyes to your beautiful Christmas cards with this timeless font. 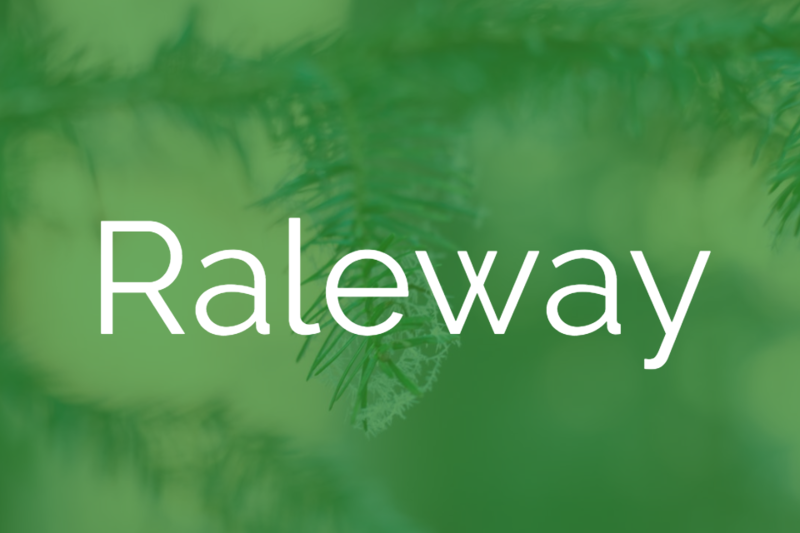 Raleway is a safe font to use in your Christmas card because you know it’s readable. It’s a minimalist font that doesn’t stray anywhere near tacky. 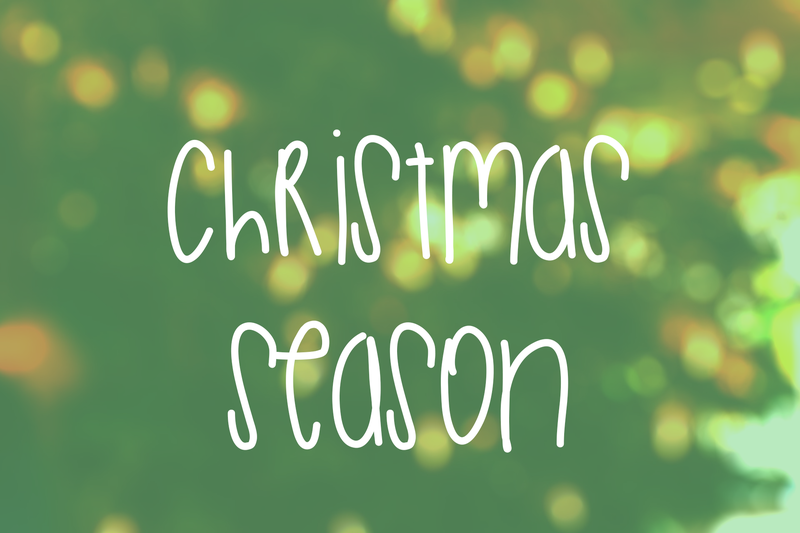 Use this font for Christmas cards that you want to share on social media or in emails, for example. 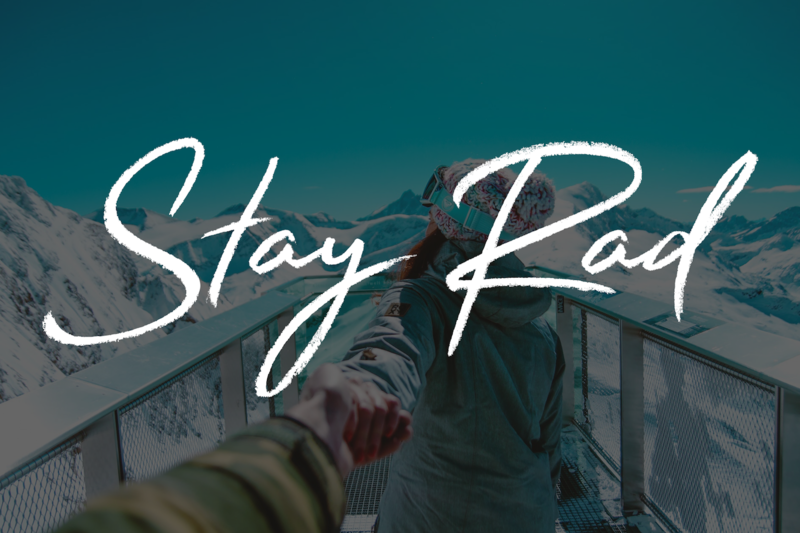 Stay Rad looks like it was written on a chalkboard in a cafe by a particularly enthusiastic barista. Perhaps to advertise their new mocha-candy-cane-concoction? 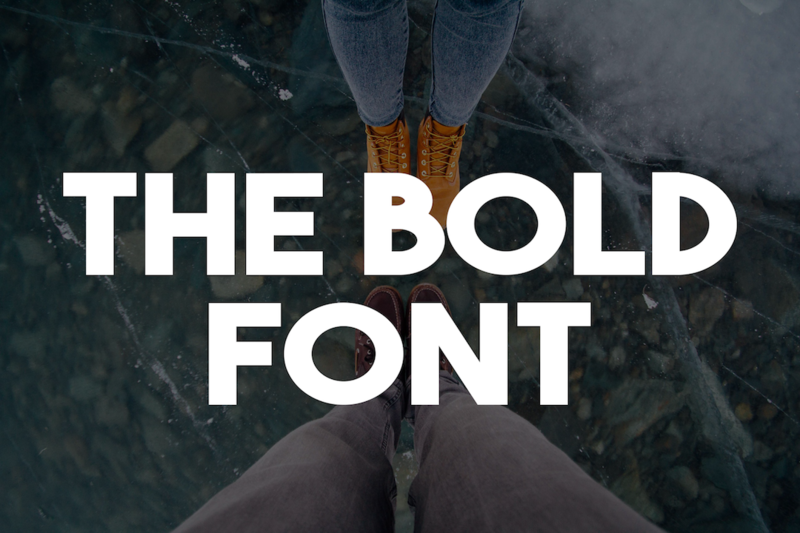 Here we have the most literally named font out there: The Bold Font. It’s big, bold and beautiful. Want your holiday card to make an impact on the recipient? Write a message that practically screams at them with The Bold Font. 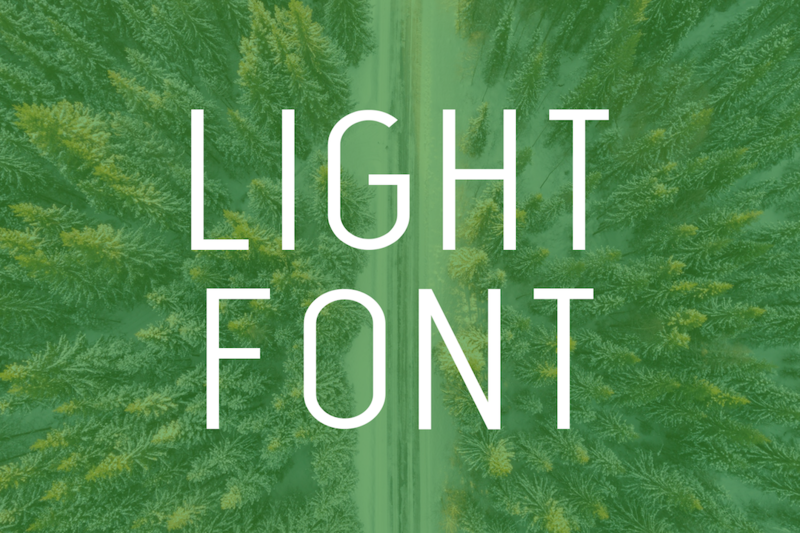 Another literally named font, because sometimes simplicity is best: The Light Font. The Light Font actually pairs very nicely with The Bold Font, which makes sense since they were both created by the same designer! 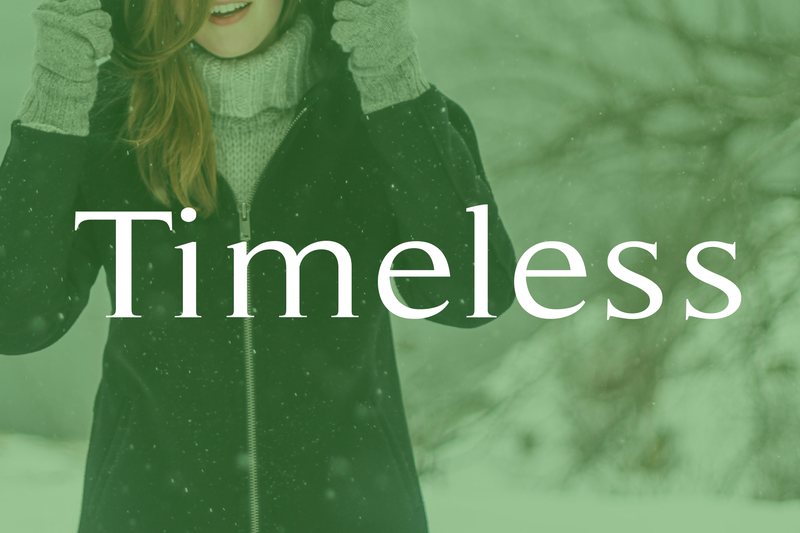 Timeless uses the classic Time magazine font heavily as it’s inspiration, with a few subtle tweaks. With this font, you could create a funny Time cover with your family picture as the cover photo. Or name yourself Time Person of the Year. 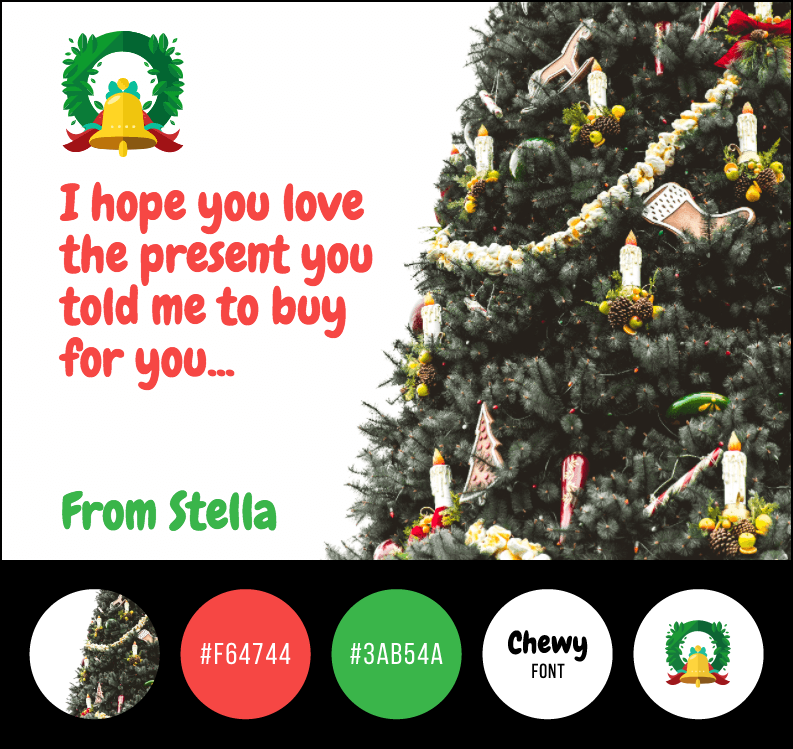 After picking the font for your Christmas or holiday card, it’s time to select a color palette. Do you want to go with a traditional holiday color palette? Or do you want to try something creative and unique? 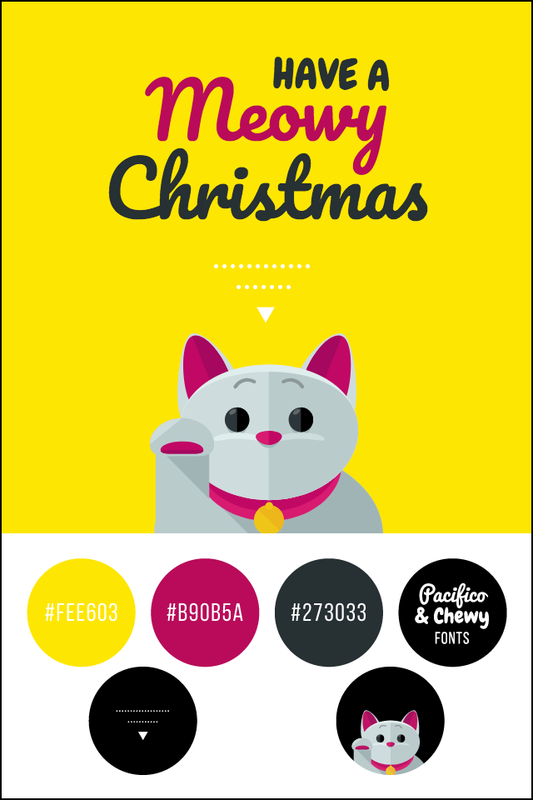 Here are 20+ Christmas color palettes for a wide variety of holiday themes. These are your classic holiday color palettes: reds and greens that you have been seeing around this time of the year for your entire life. Use the darker reds and greens as your main holiday card colors, and then add the lighter ones or white as your accent colors. Use bolder colors if you’re trying to persuade some to take an action (like asking for a Christmas fundraising donation). These warm color palettes reflect the cozy feeling of the holiday season. Golds and reds appear throughout these warm palettes to still evoke a wintry feeling. There are also lots of golds and silvers, for a splendid feeling. 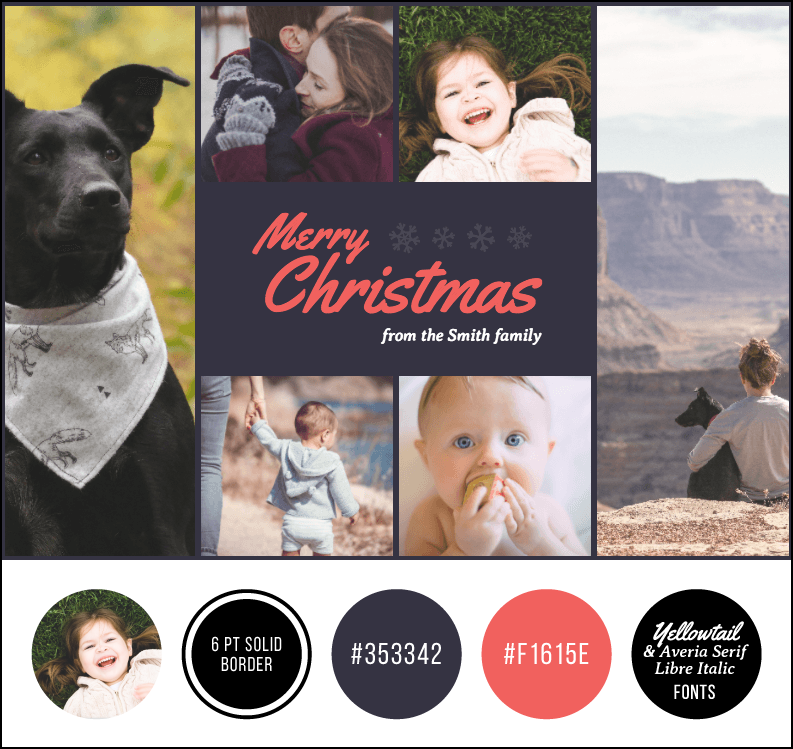 While people are getting a ton of red and green holiday cards, a modern color palette will stand out significantly. Capture the cool, blue tones of the season with a winter color palette. Each of these palettes uses a shade or multiple shades of blue as the central color. 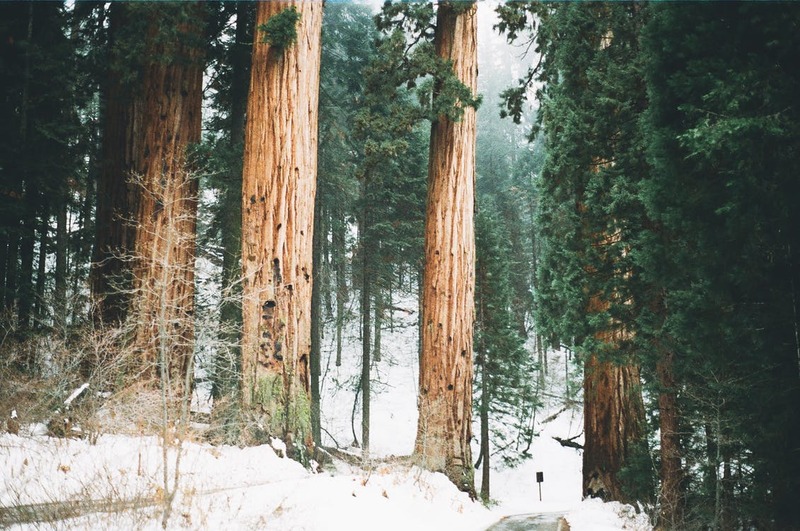 They were influenced by the snow-capped mountains and icy landscapes that we see each winter. 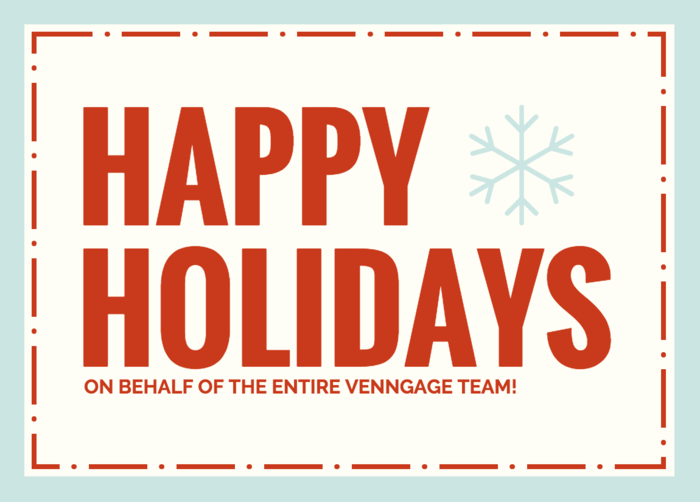 This was the Venngage Holiday card last year, created by one of our talented designers. 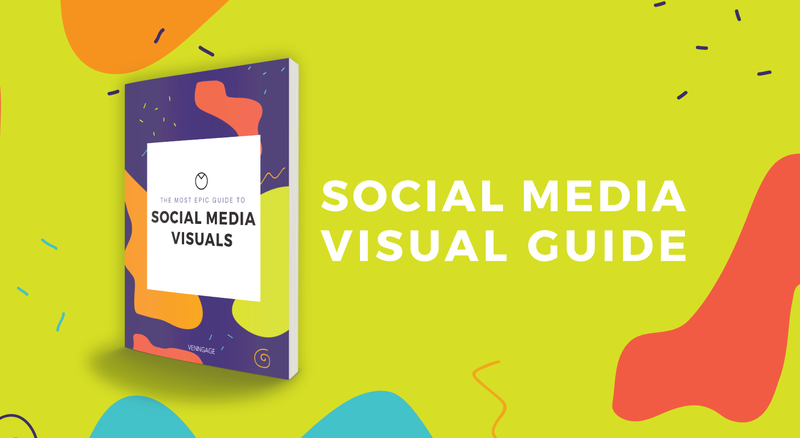 This design approach is great for companies and brands that want to appeal to as many of their customers as possible. Natural colors give your holiday cards a cozy and comforting feeling. They’re perfect for creating designs with a nostalgic feeling. For example, instead of using green and red, a few palettes use green and orange for a more earthy color palette. The reds and greens in these color palettes are also a lot darker than traditional holiday color palettes. Using tints and shades of the same color can help you create a classy, modern design. To create a gradient palette like this, all you have to do is start with the main color and pick several shades darker or lighter to complete your palette. 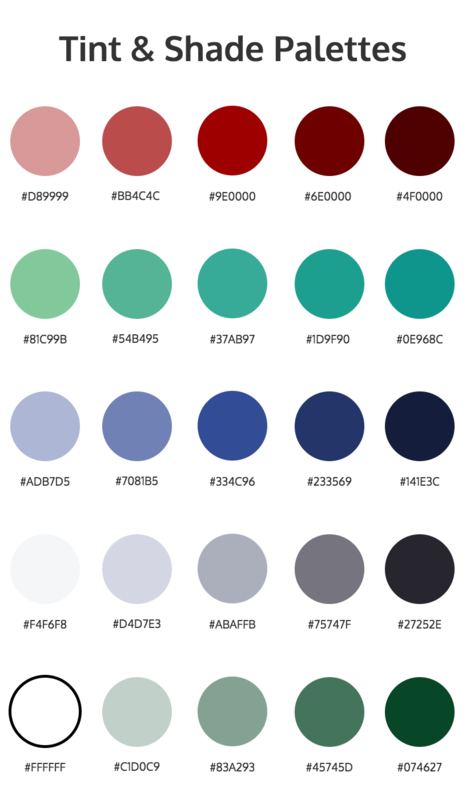 If you don’t have much experience pairing colors, creating a color palette like this is a great place to start. Icons are like the stickers you used to decorate your construction paper cards with in preschool. They’re fun, compact and come in all sorts of different styles. We’ve put together 5 holiday-themed icon collections to make finding the right icons for your cards easier. 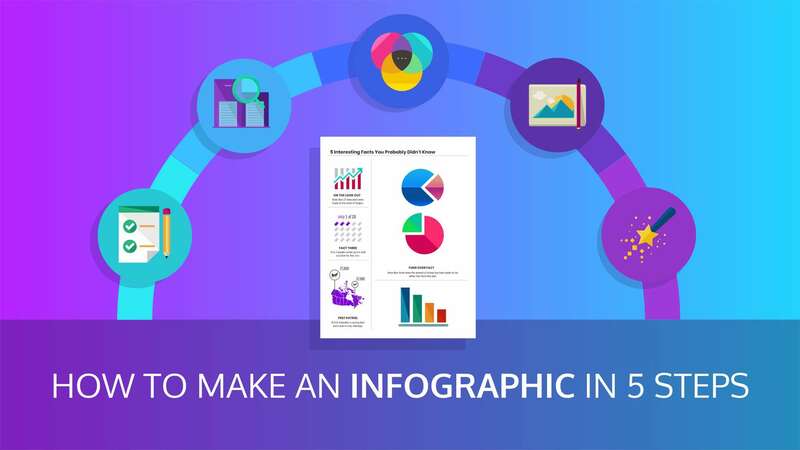 Illustrated icons are one of the biggest graphic design trends of 2017. They’re fun, a bit childish and great for illustrating ideas creatively. 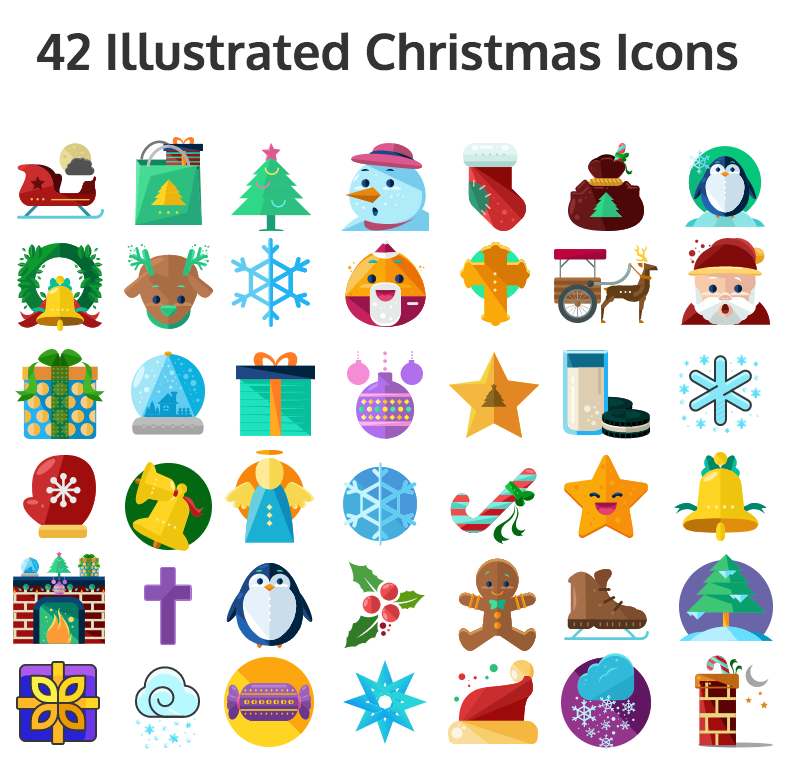 These illustrated Christmas icons are perfect for adding some flair to your Christmas card design. 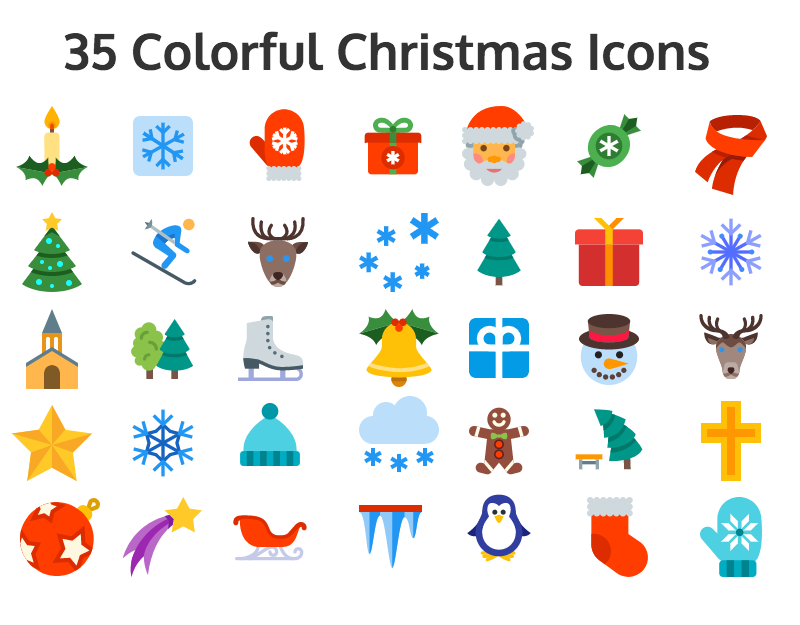 These colorful Christmas icons are similar to the illustrated icons set, but flatter. These are a little more subtle in their design elements than the illustrations as you can see. They aren’t going to distract from your main greeting or the photo on your Christmas card. Now if you are looking for the most versatile types of icons, use flat icons. You can use them as much or as little as you like on your Christmas cards. They can be the main focal point of your design, or lightly fade into the background. Plus, you can change their colors, which makes it super easy to match your color scheme or our color palettes. 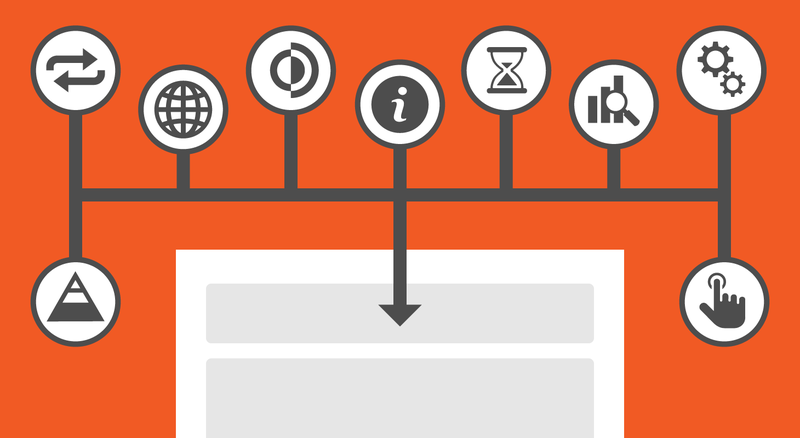 There are a ton of possibilities for how you can use flat icons! These simple Hanukkah icons are perfect for embellishing your holiday cards. 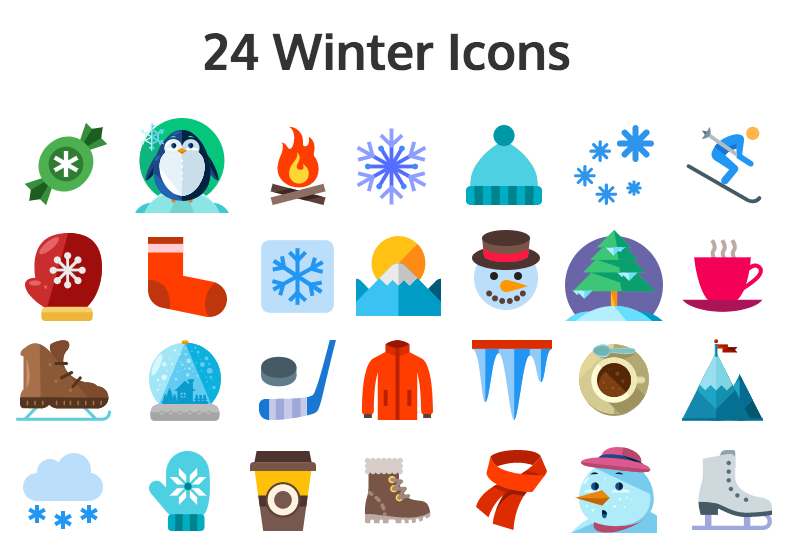 These winter-themed icons are perfect for all kinds of designs–holidays, winter birthdays, winter events, you name it! Once you have your fonts, color palette and icons picked out, it’s time to pull it together in a beautiful card design. 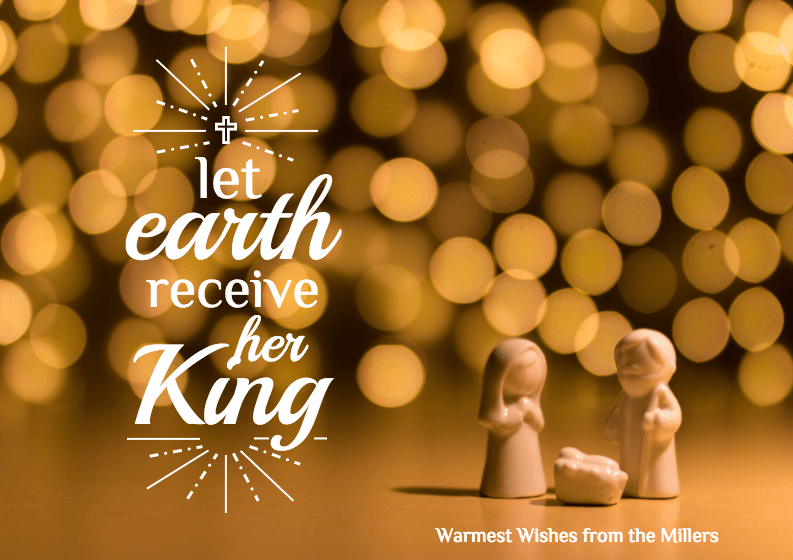 We’ve put together 20 Christmas card templates to help you get started. We have also included recipe under some of them to show you how you can combine fonts, colors, and icons to create beautiful cards. Use these templates to create amazing Christmas cards in a pinch, or use them as a springboard to create your own creative designs! 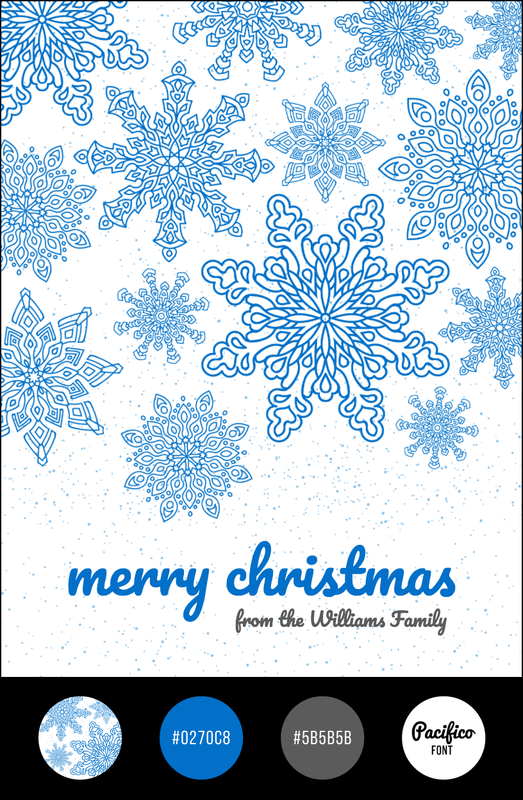 You can visit our templates library for even more Christmas card templates. Show your family and friends that you are thinking about them during the holidays with this family Christmas card. 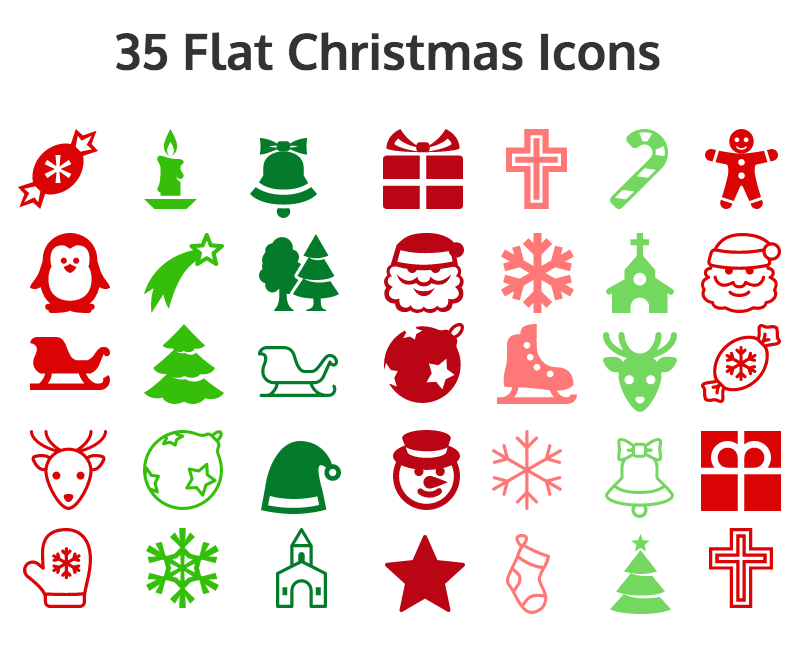 The collection of Christmas and holiday icons creates a fun wreath, with room to write a nice message in the center. 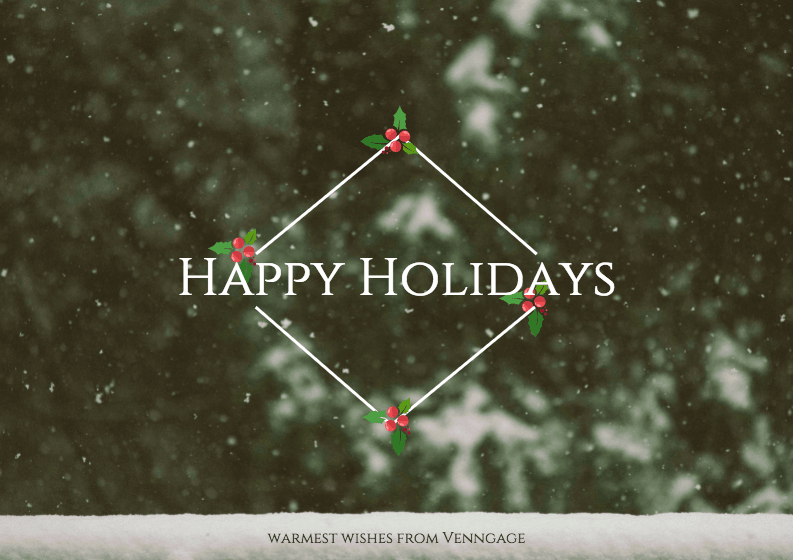 A simple greeting like Happy Holidays is ideal for a corporate holiday card. The simple, heartfelt message on a warm, natural background will help convey your warm wishes! 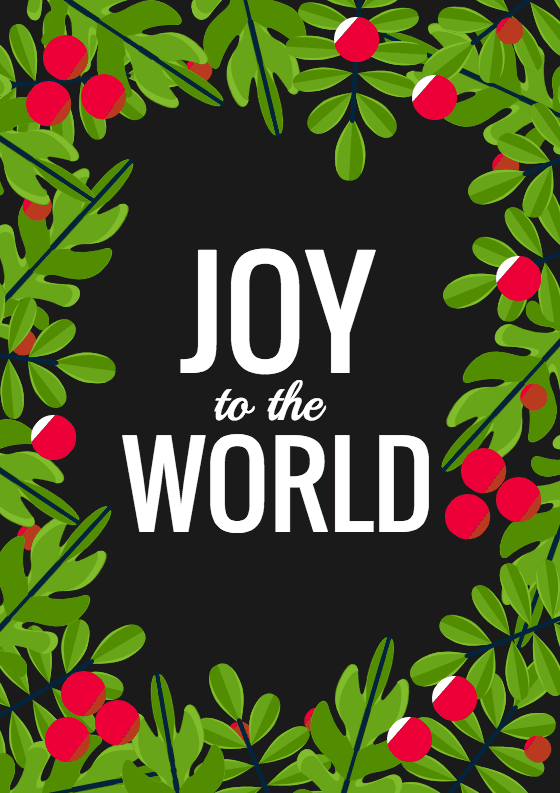 This card uses a holly-themed border to frame its joyful message. Borders are a great way to create a well-rounded design. You can create your own border using icons, or by uploading a border image you create yourself. But in a pinch, this template will suit all kinds of messages! 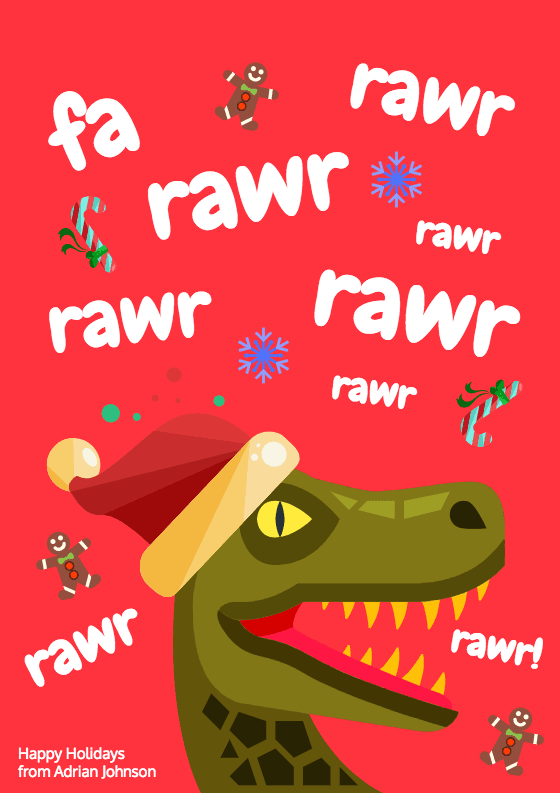 How do you sing Christmas carols in dino-speak? This Christmas card template answers that question. Swap out the message in the bottom corner with your own, or come up with another prehistoric song for the dino to sing. This card is sure to get a laugh from your friend, families, or customers! In a world of green and red Christmas cards, a golden color palette will look unique. This card has a warm, classy design. 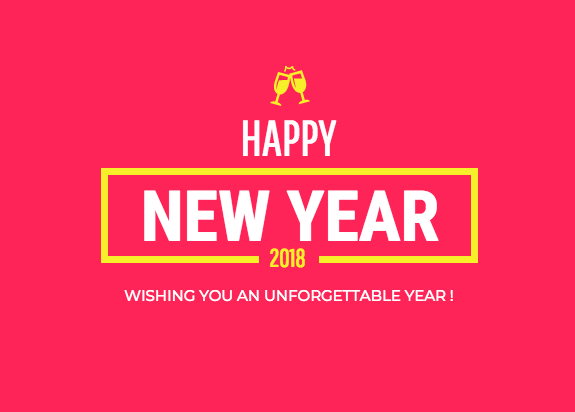 You can customize this template as little or as much as you want by replacing the message with your own, or even swap out the background image for another similarly warm and golden one. 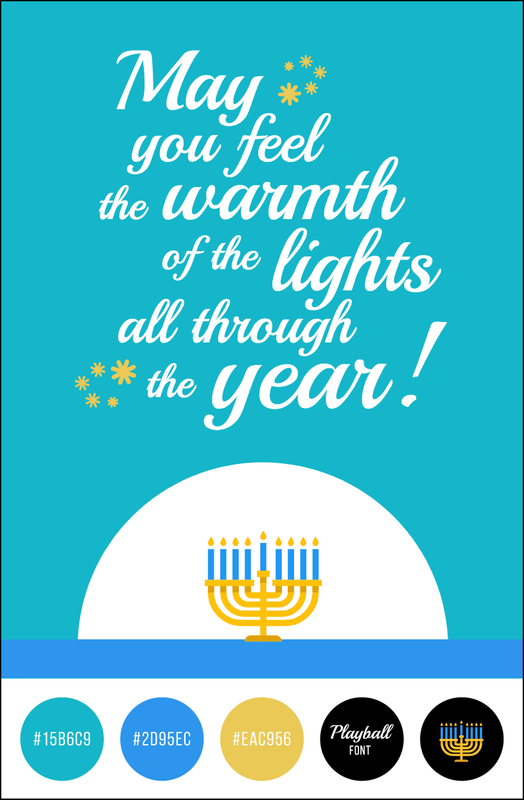 Add some brightness to long, dark winter nights with this bright and colorful Hanukkah card. 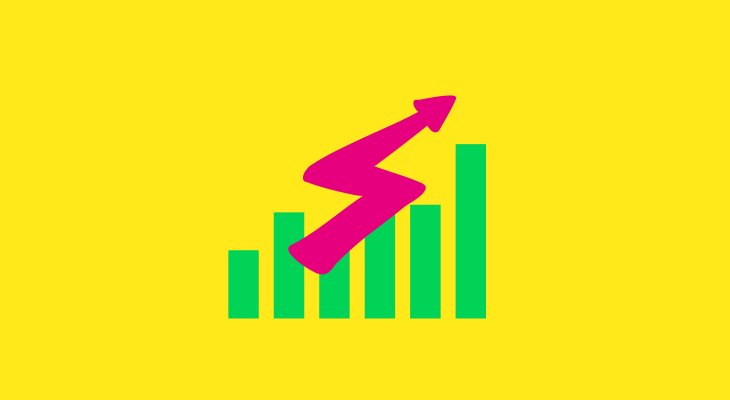 The white font and yellow icons contrast with the teal background to create a vibrant design. 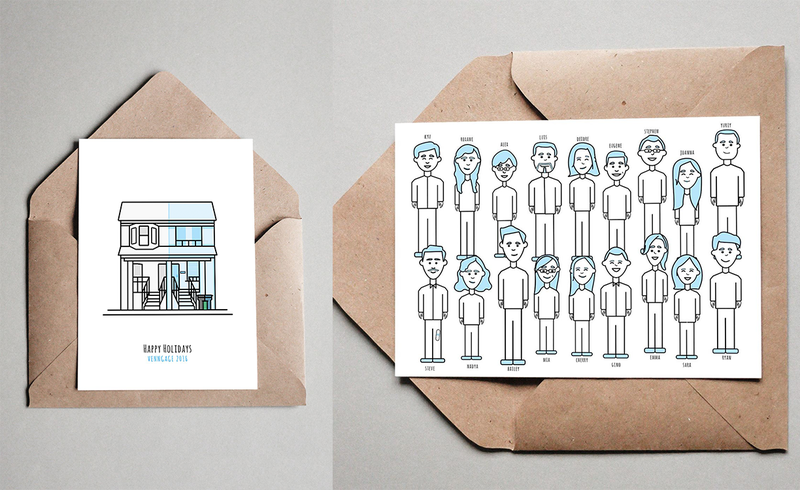 This quirky Christmas card is an example of how you can use icons creatively. Grouping icons together to make shapes is a simple way to create an original card design! You could easily play around with the specific icons in this template, or even add to the picture to make it your own. Use your own photos to create a personal family photo card. Share pictures of your family, friends, or even coworkers–after all, the holidays are about the people! This card template uses image frames and solid borders to incorporate multiple photos into one cohesive card design. Just because the holidays are all jingle and cheer, doesn’t mean you have to sacrifice your sassy sense of humor. 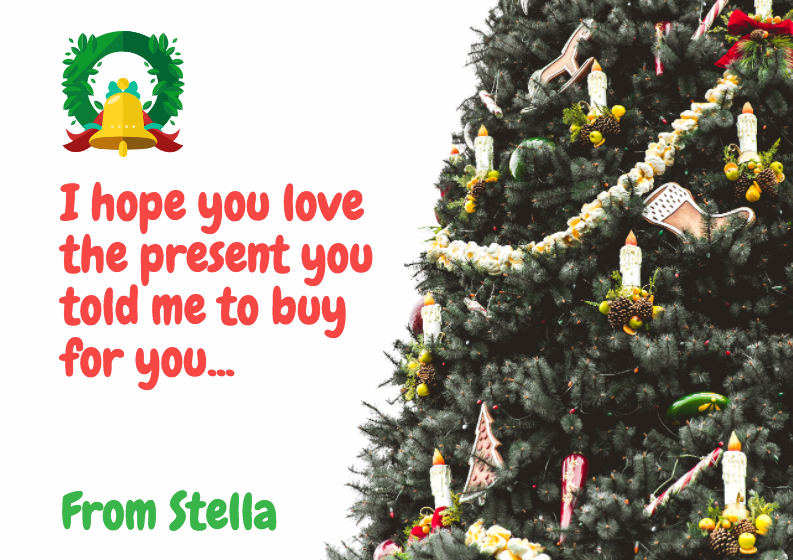 Tell someone you love them (but not too much) with this sassy Christmas card. Got your own quip? Throw it in there! Look at those cute icons all in a row! 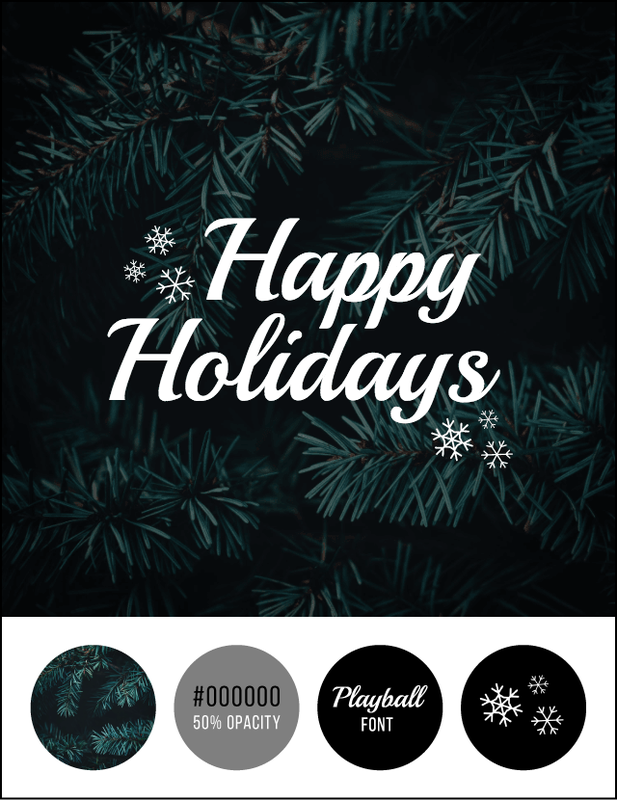 This simple holiday card template is perfect for beginner designers. Personalize the greeting, change the colors or swap out the icons for your own and voila! You’re done. 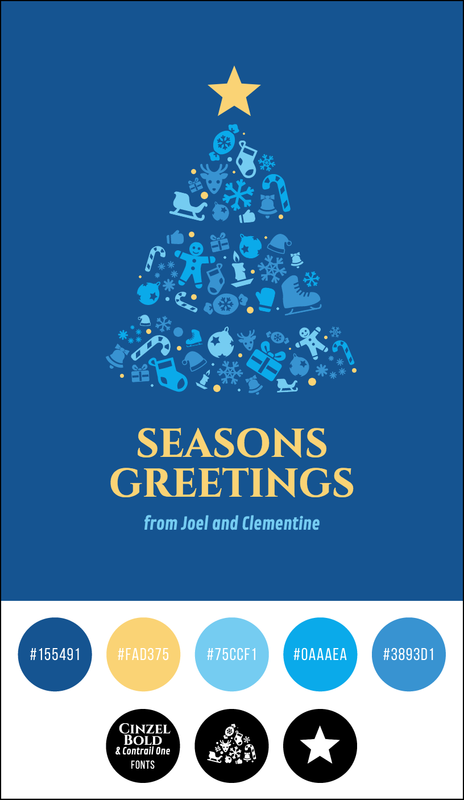 A simple non-denominational holiday card is an excellent choice for seasons greeting from your business. Combine a heartfelt greeting with a wintry background image for an inclusive holiday campaign. 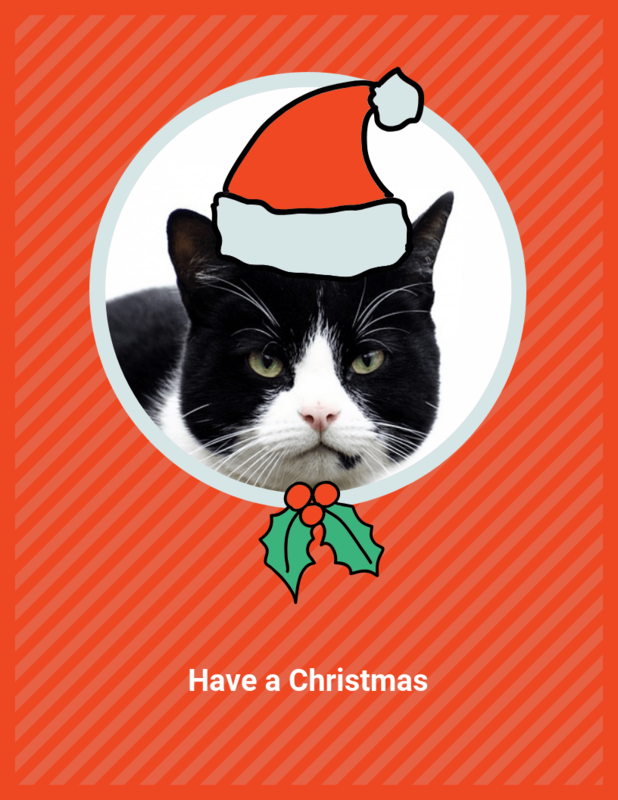 If you like puns and cute cats, this is the Christmas card is for you. 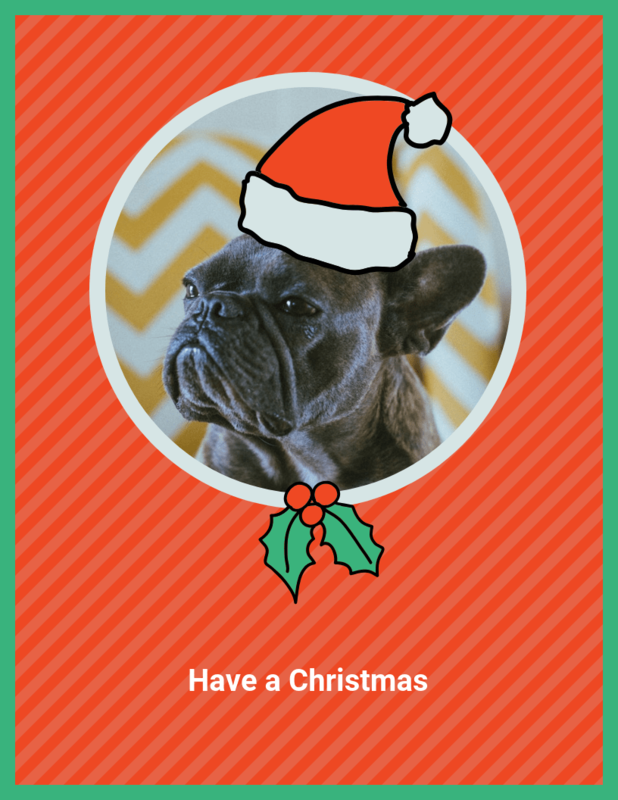 You can easily create your own fun Christmas card using an icon (you can’t really go wrong with pictures of animals) and a fun decorative font. This card is the cat’s meow! 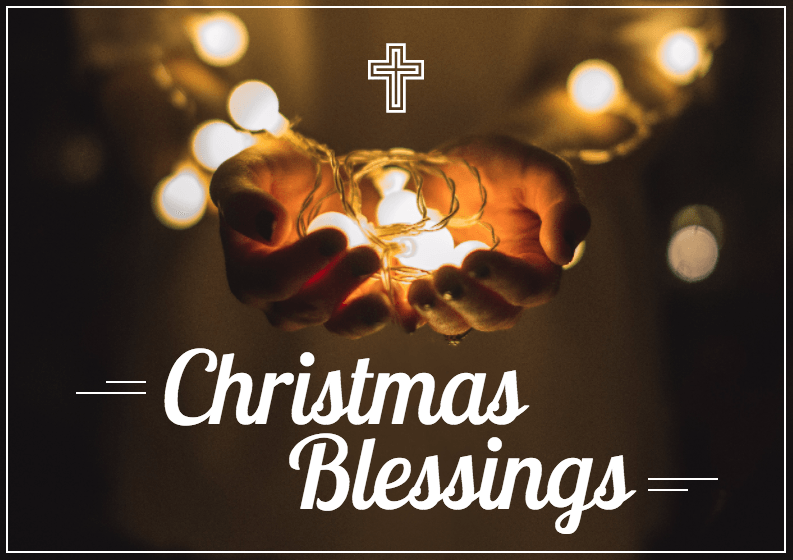 This elegant Christmas card template combines a classy font with a deep-colored background image. Combining a dark background with light font will help your message pop out at readers. Plus, it makes for a holiday card design with impact. Right after Christmas comes New Year. Don’t let the New Year sneak up on you! Get your New Year’s greeting cards ready, starting with this simple by snazzy New Years card template. Don’t want to plaster red and green all over your Christmas card? The blue and white palette helps the card look very modern and clean. No two snowflakes are exactly the same, and neither should your Christmas cards be! This is another card that uses a modern, elegant color palette. The golden border and script font make for a timeless card design. This is a card template that would work with a wide range of different color palettes. You could also easily repurpose this template for a wide variety of occasions. 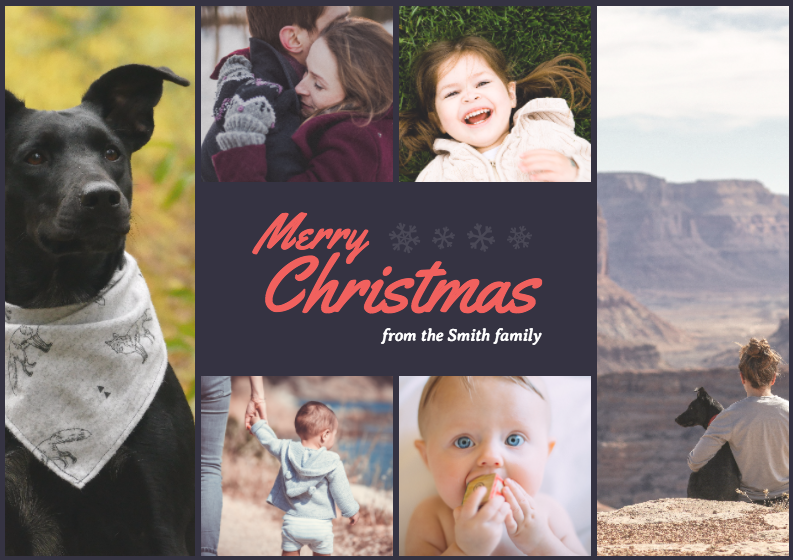 This is a fun Christmas card template that is perfect for sharing on social media or including in an email. It’s bright, bold and a bit eccentric–like your favorite ugly Christmas sweater. 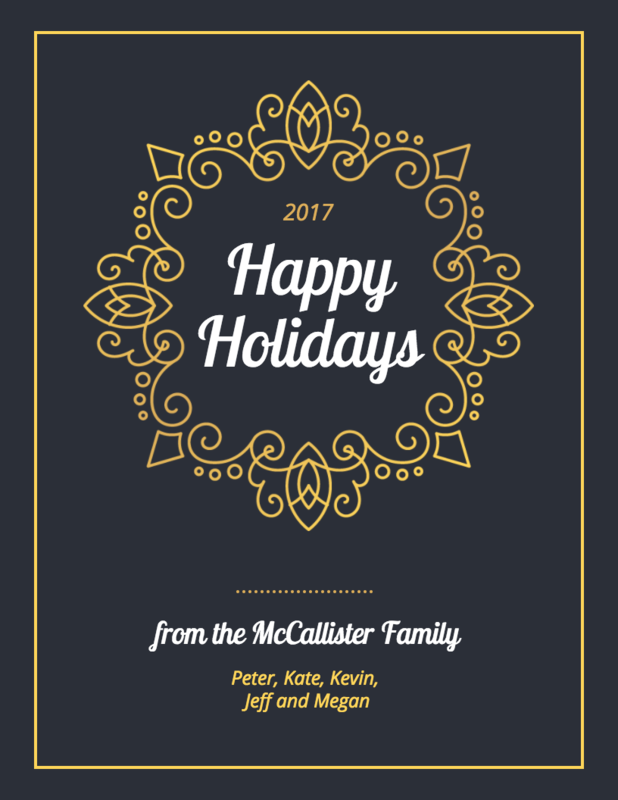 This dimensions of this holiday card template make it perfect for including in an email or in a tweet. It’s simple, classic and reminiscent of a physical Christmas card. You could definitely print this card template out if you wanted to send it the old fashioned way as well! 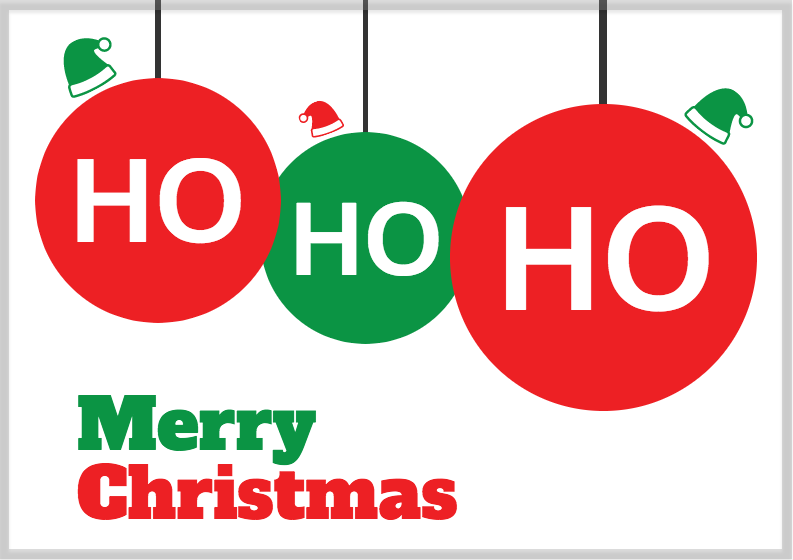 Bring a little childlike wonder with this minimalist Christmas card template. The block colors and sans serif font make it perfect for adults and children alike. 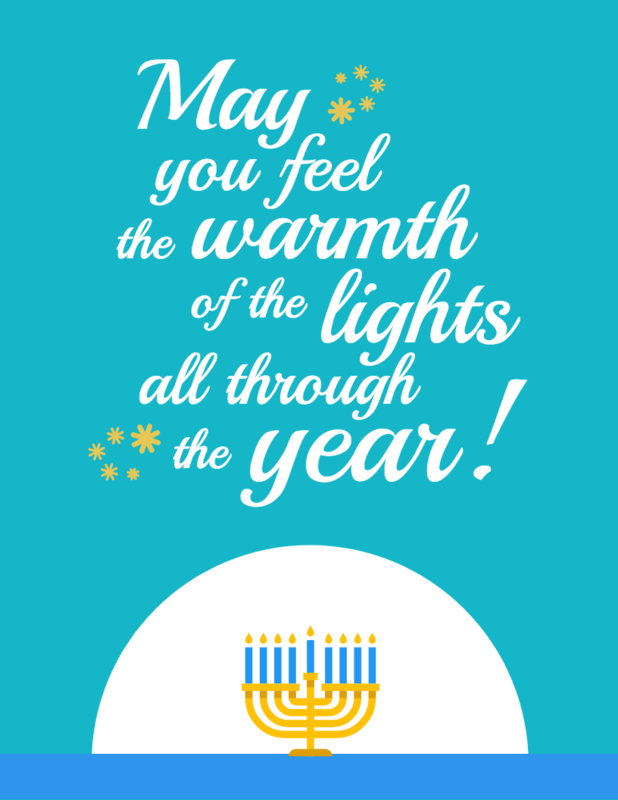 This simple but visually stunning Hanukkah template is perfect for sending to anyone. Using two borders of different thickness gives the card a picture frame look–perfect for framing your greeting! People like cats. People like cards. Need I say more? People also like dogs. The card thing still stands. The holidays can be a real strain on your time and sanity. Being able to DIY your own visually-stunning holiday cards yourself will not only save you the cost of hiring a designer, they will also give your correspondents a personal touch. Pair big, decorative title fonts with simpler body fonts. Pick a traditional color palette to appeal to your recipient’s sense of nostalgia. Pick a modern color palette for an out-of-the-box design. Use icons that have a consistent style to create a cohesive design. Start with a template and customize the design to fit your brand (Venngage’s Brand Kit can help you do this). Don’t forget to include calls-to-action in your marketing materials. A/B test your marketing materials and nurture your sales funnels. 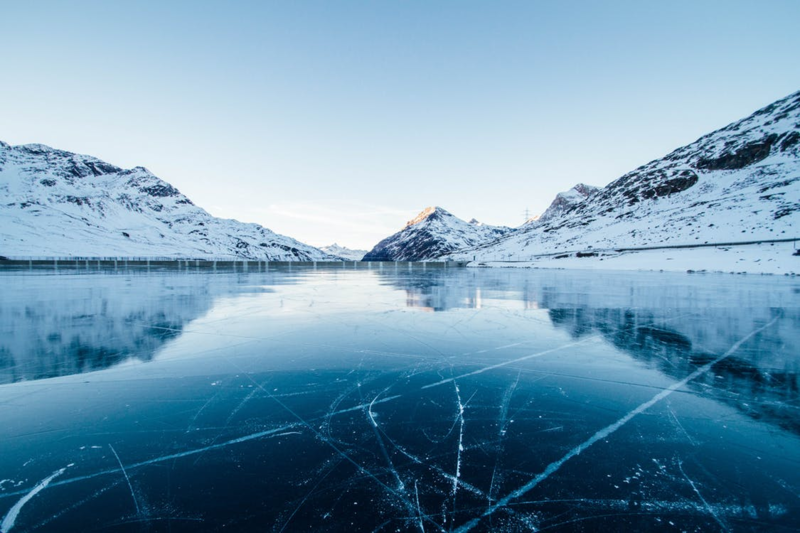 While you should be showing your friends that you care about them year-round, the holidays are a great time to do something special. So have fun with your designs and don’t be afraid to get creative! 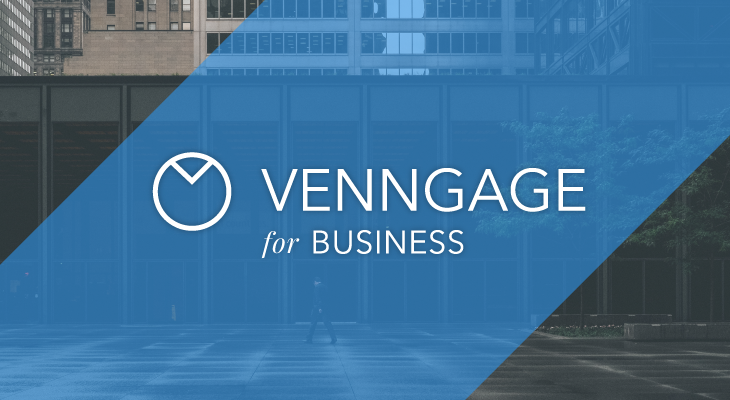 Check out Venngage, the online Graphic Design tool for more beginner-friendly templates. Ryan McCready went to the University of Arkansas and graduated with a degree in economics and international business. Now instead of studying the economy he writes about everything and enjoys stirring the pot.